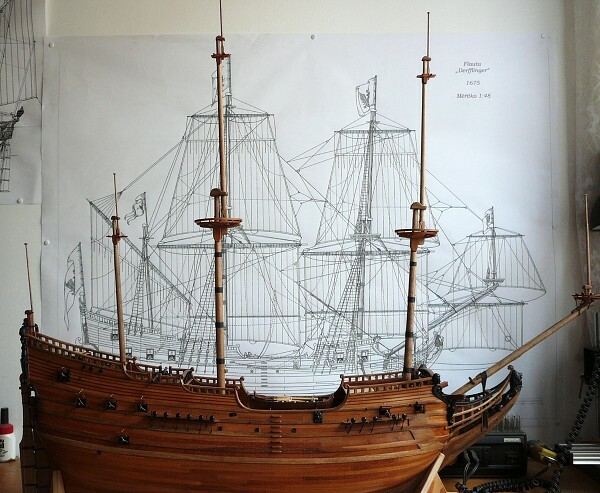 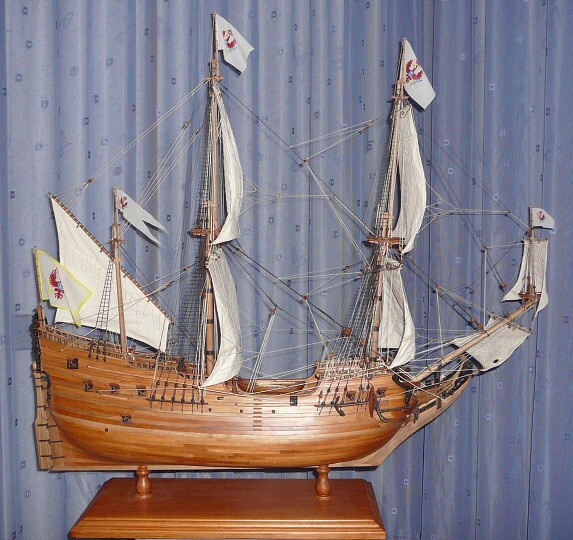 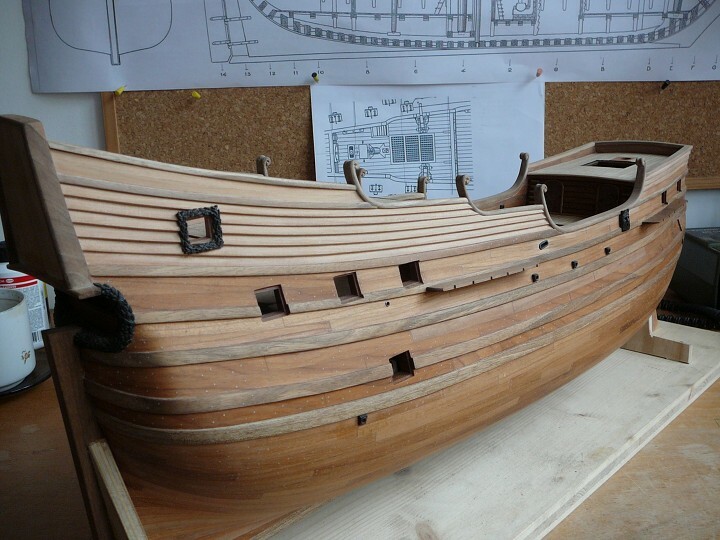 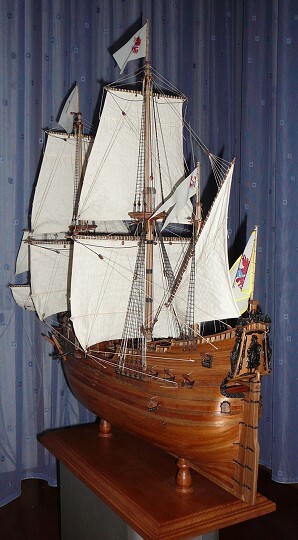 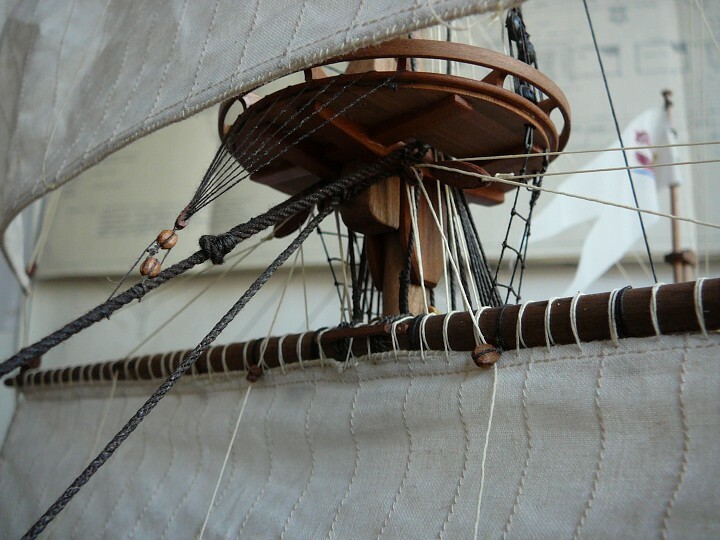 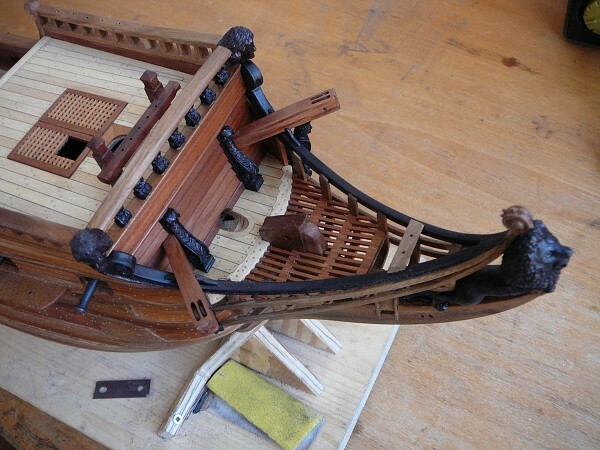 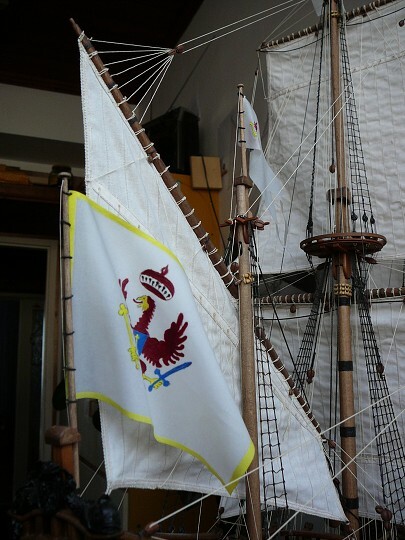 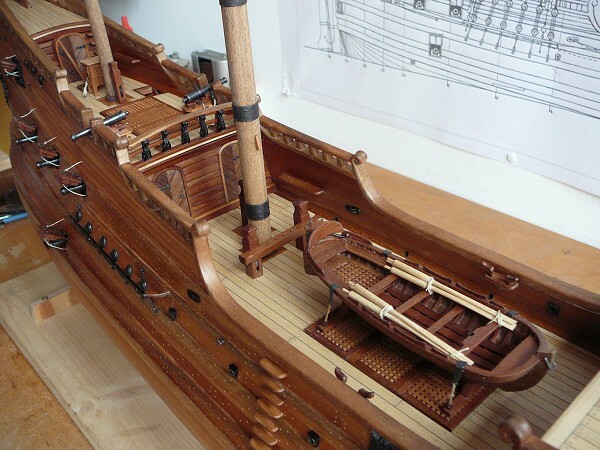 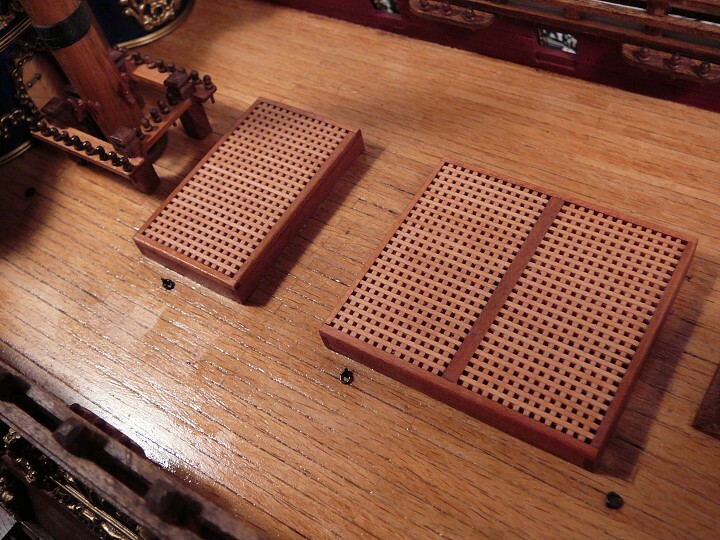 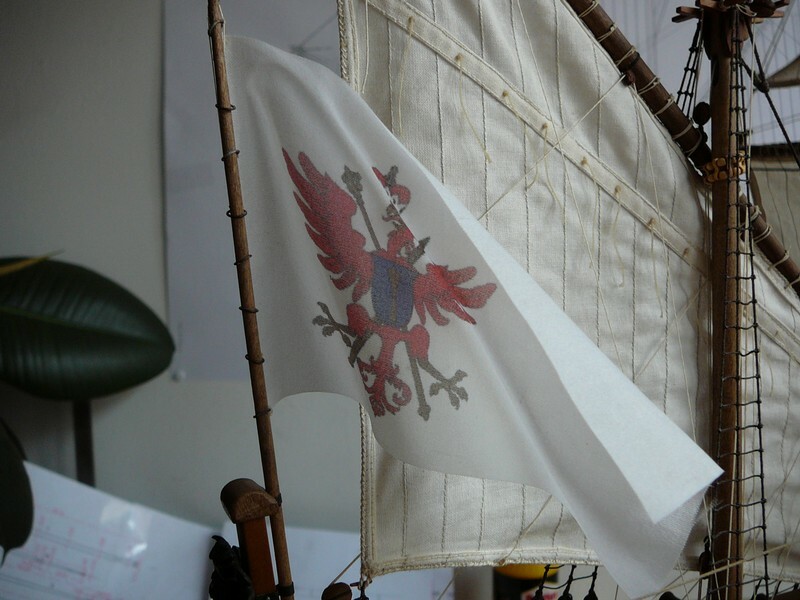 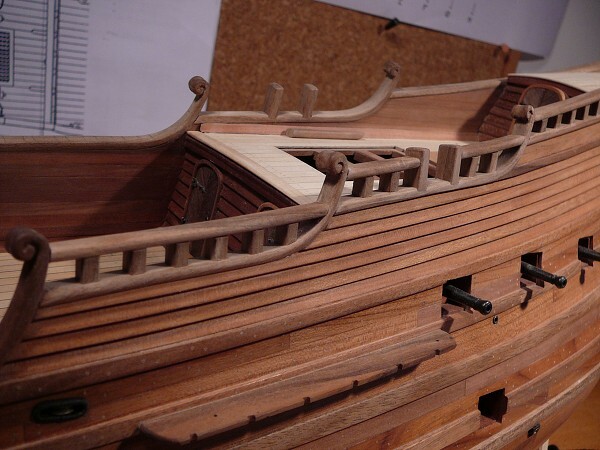 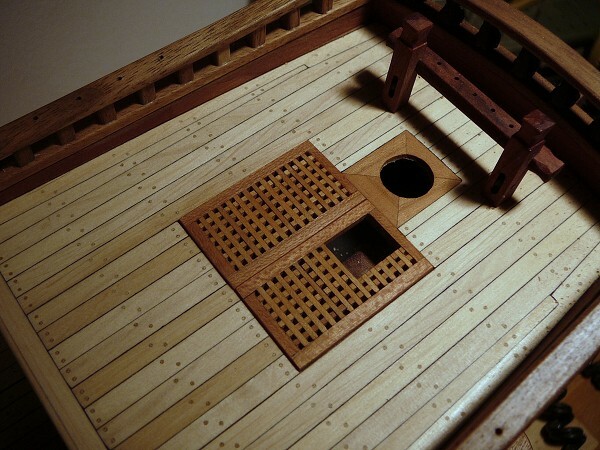 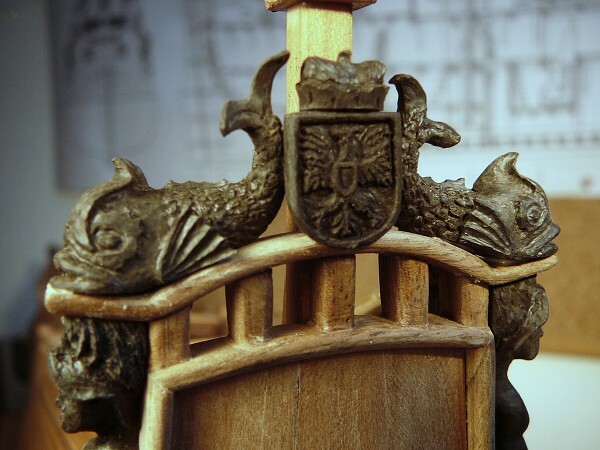 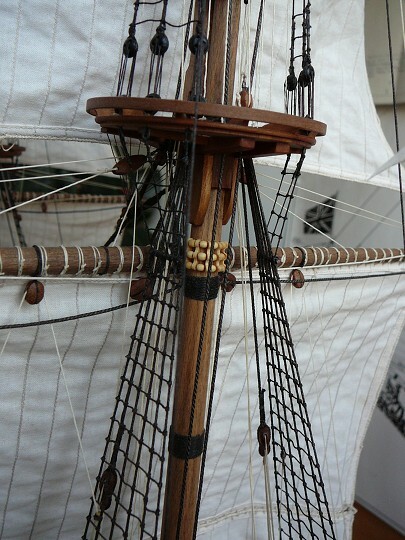 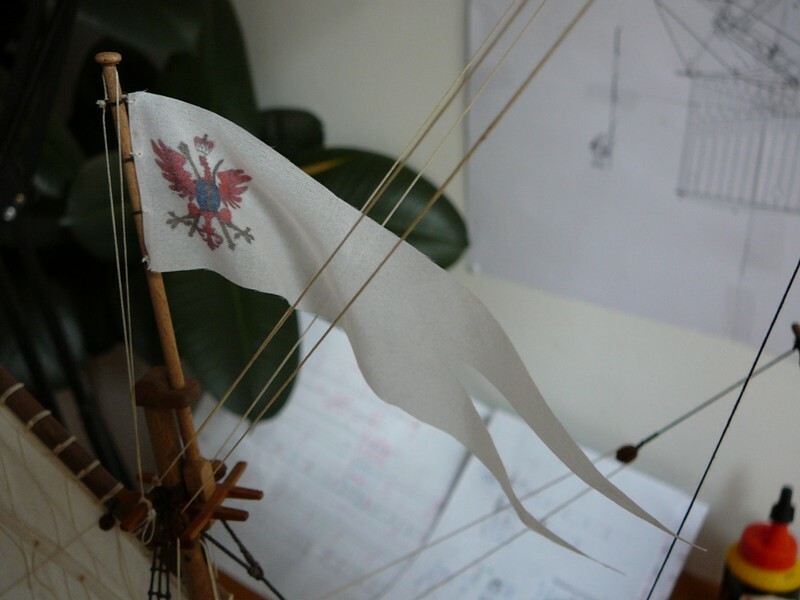 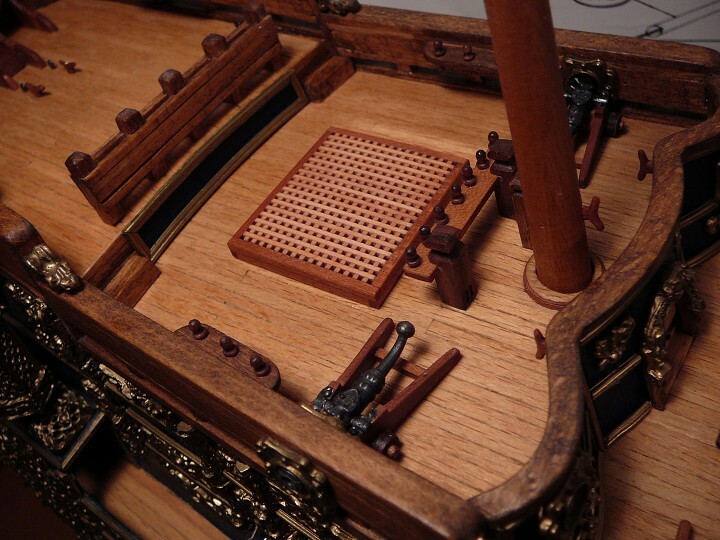 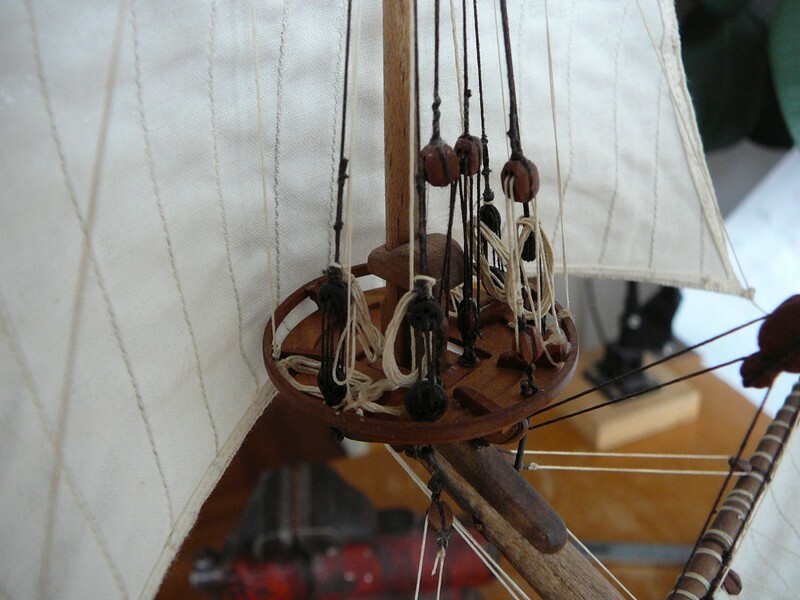 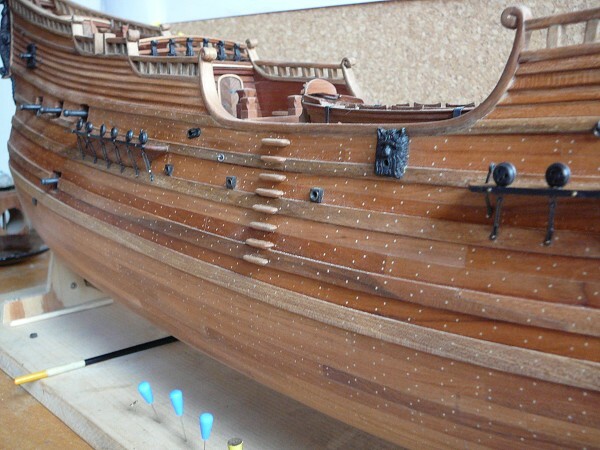 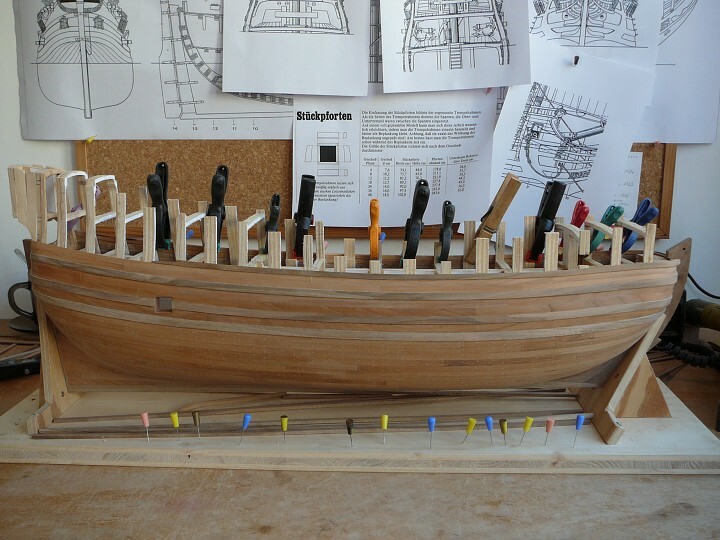 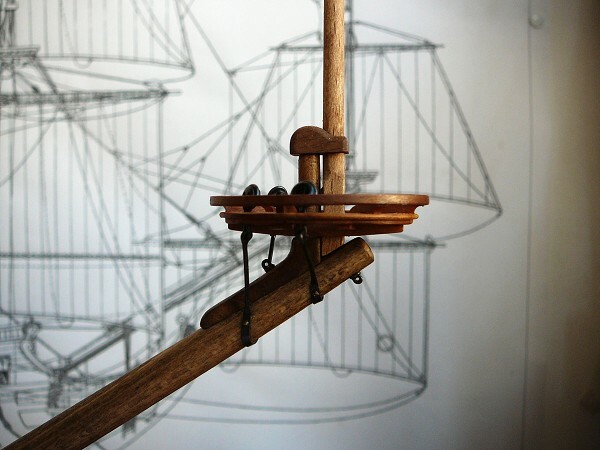 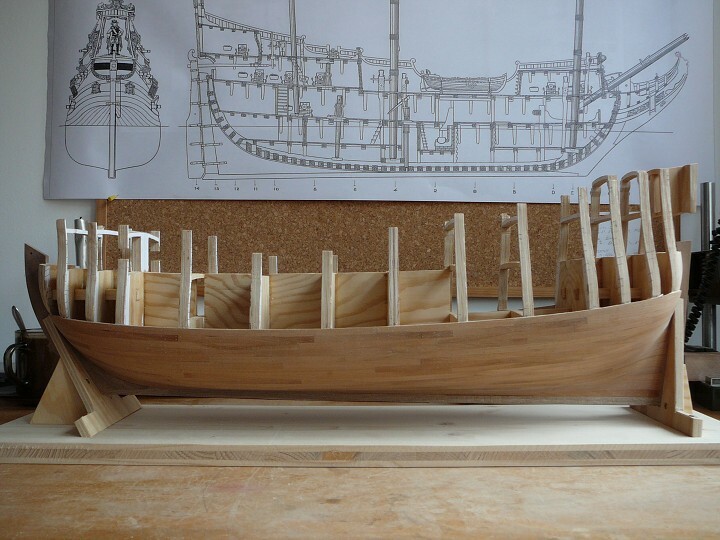 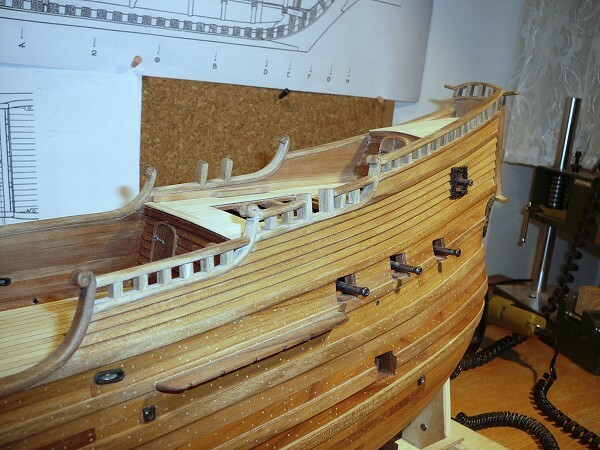 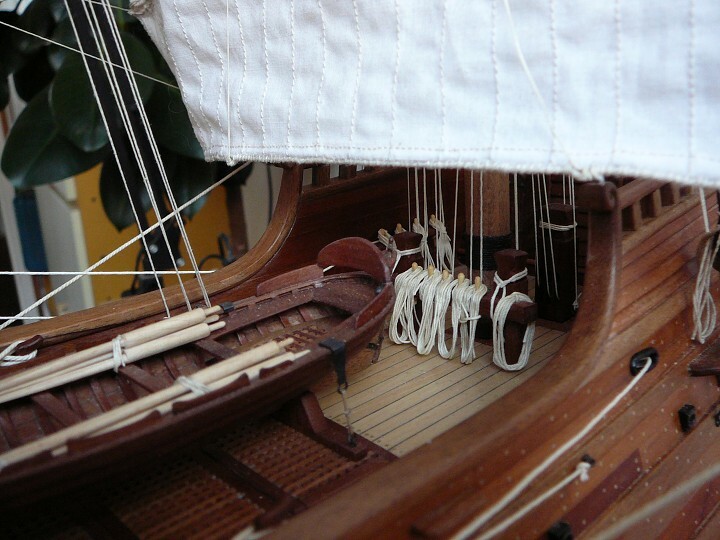 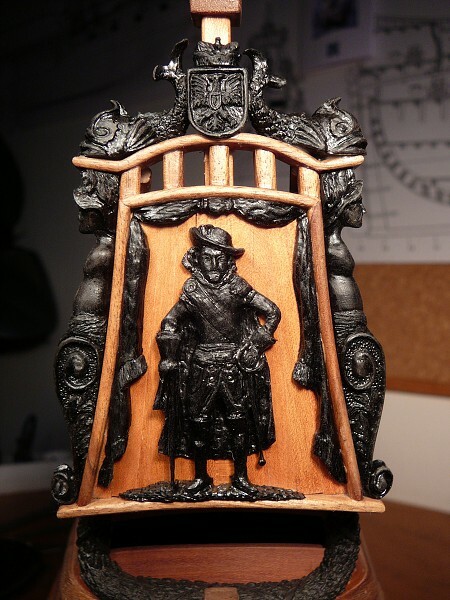 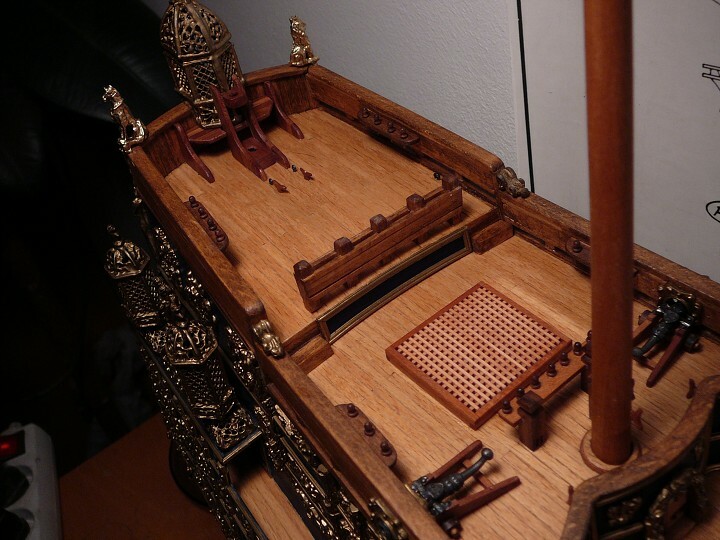 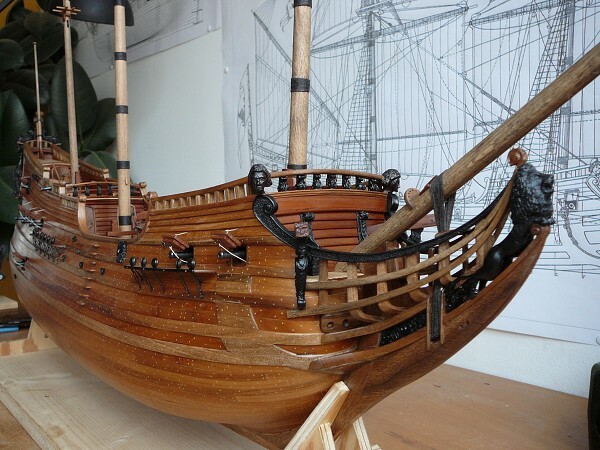 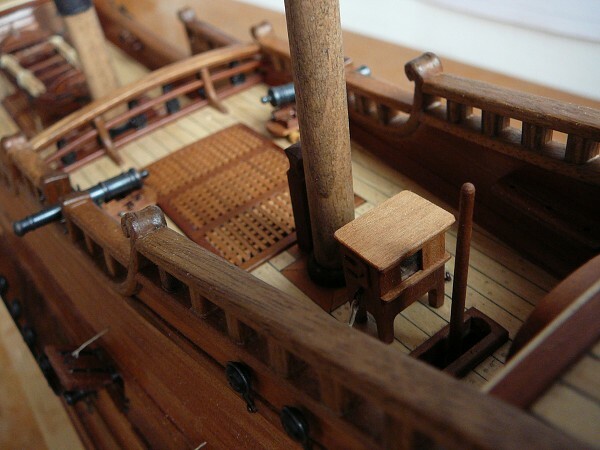 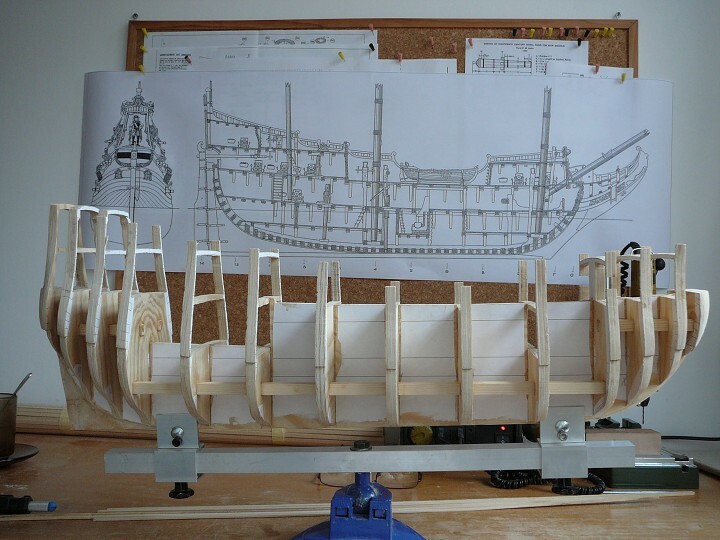 The next model that I began to build was fluit "Derfflinger", orriginally built in 1675. 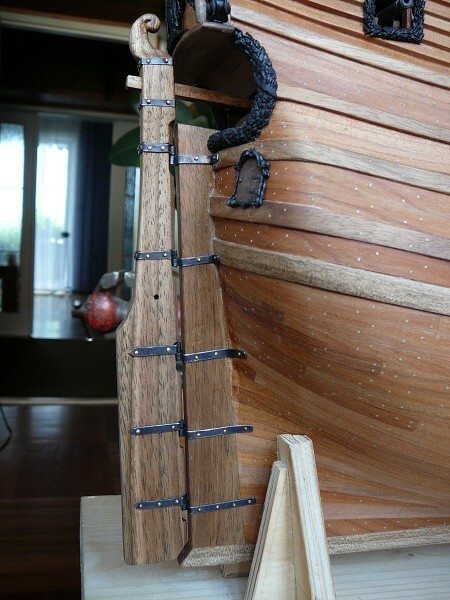 She is primarily interesting for her different construction. 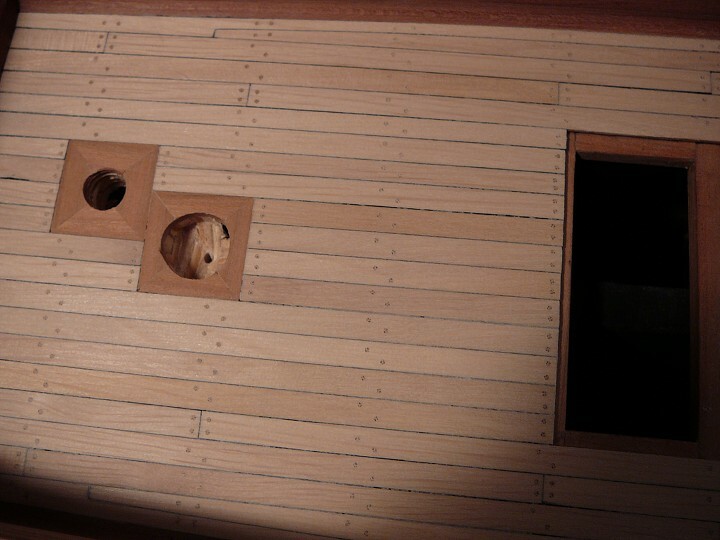 In comparison with ships with flat lower mirror the fluits have round stern and very slim upper mirror and also fat hull. 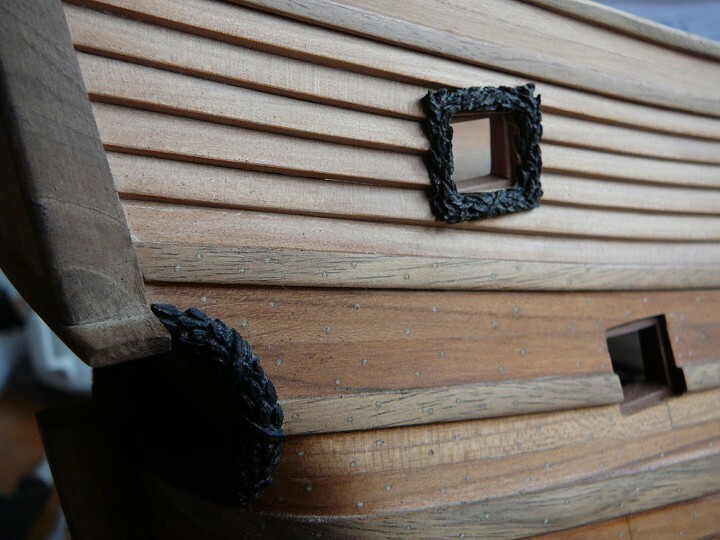 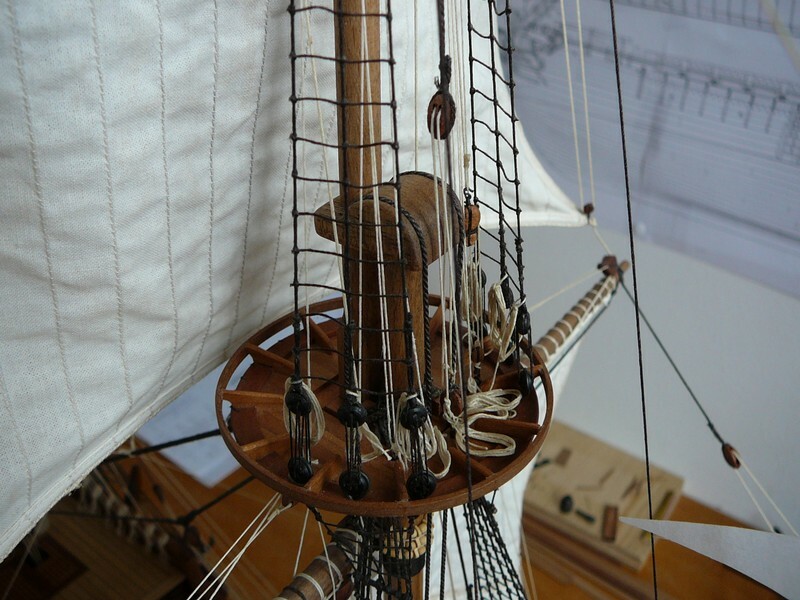 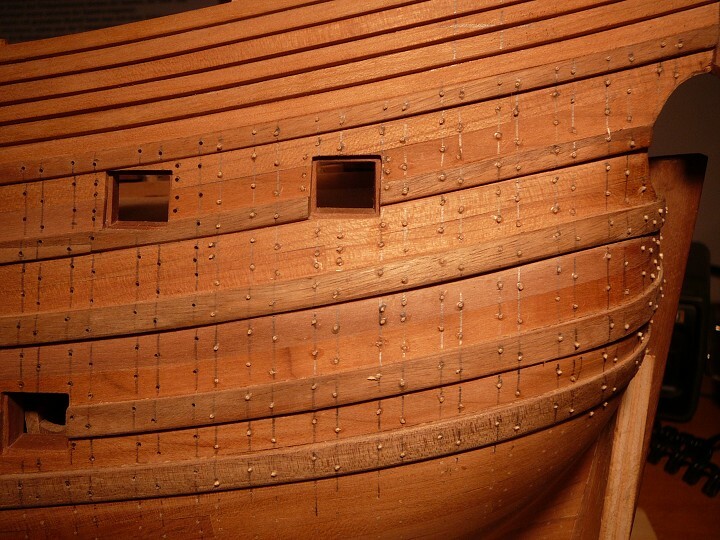 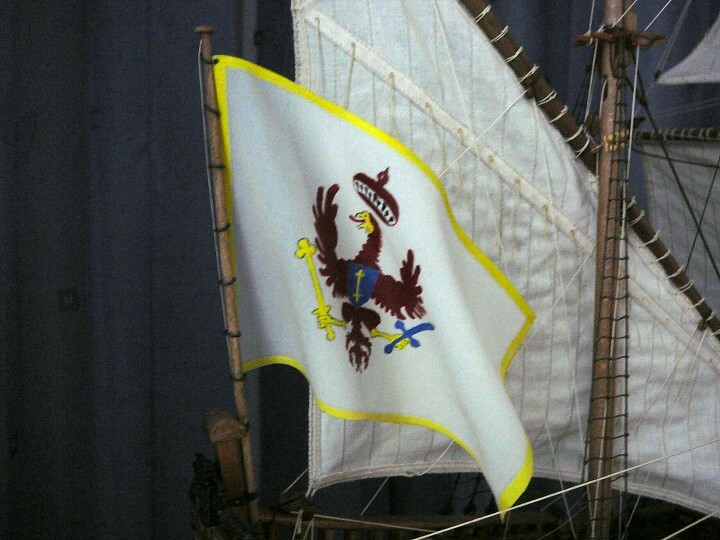 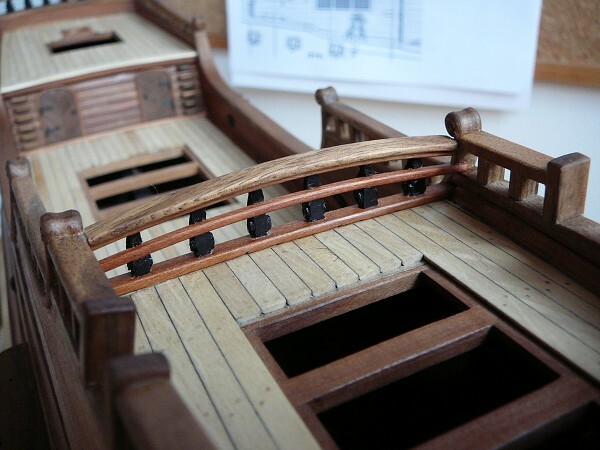 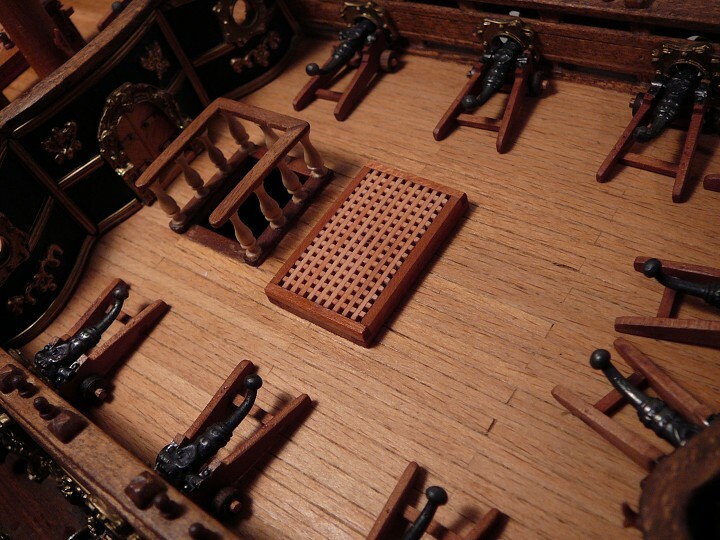 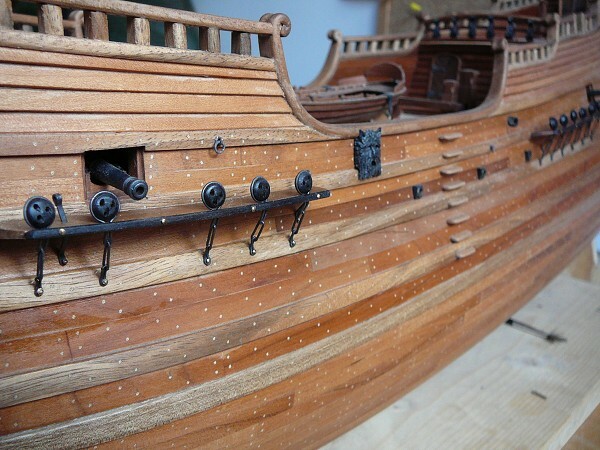 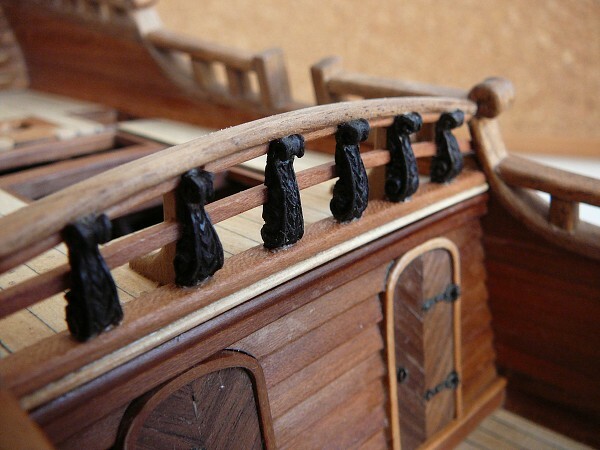 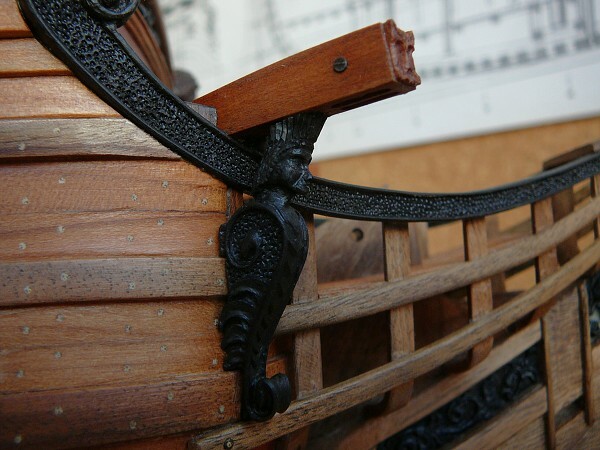 The very first construction of these ships features to 1595. 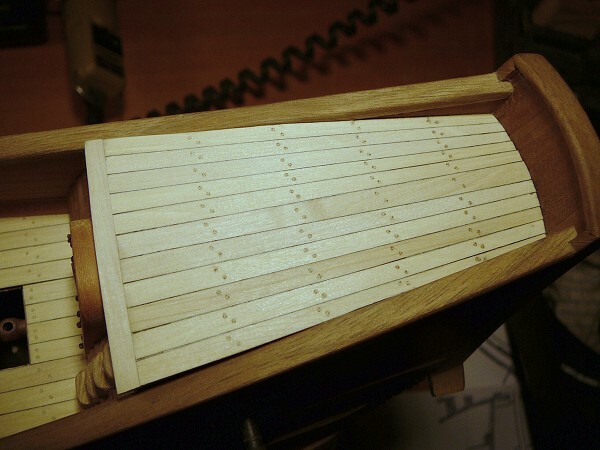 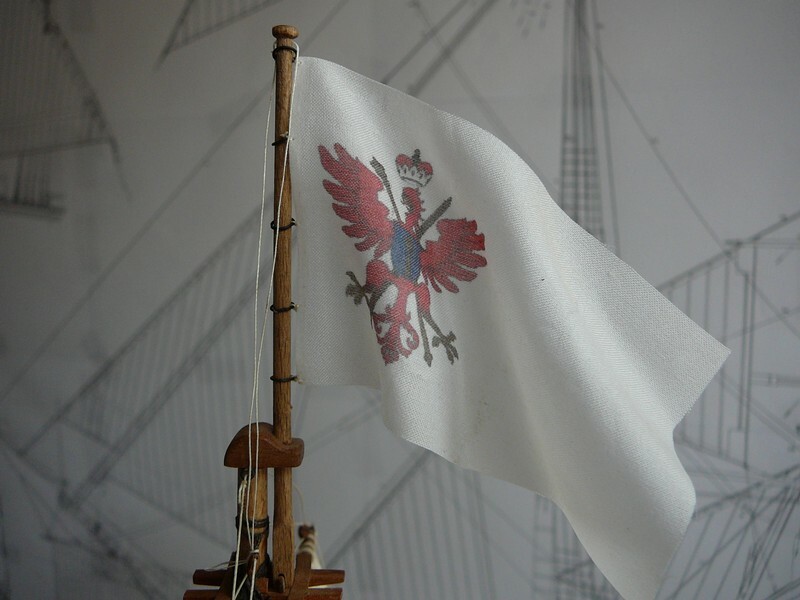 There was the first fluit built in Germany in 1618 and the last one in Lubeck in the year 1780. 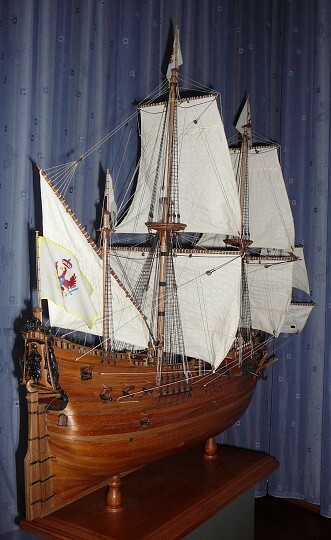 In the year 1972 I bought a book "Risse von Schiffen des 16. und 17. 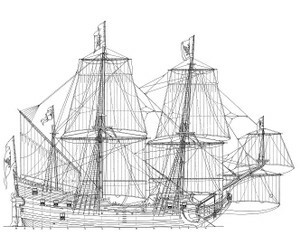 Jahrhunderts" which was written in German language and which also contained these plans. 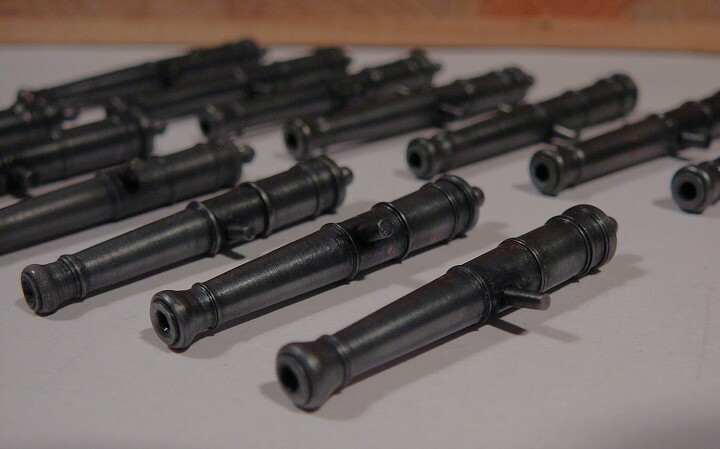 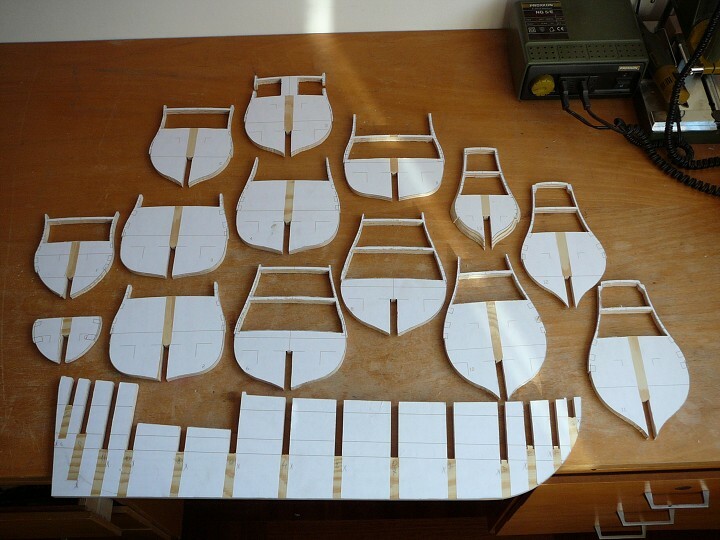 I scanned them and thanks to the help of CAD program adjusted them on scale 1:48. 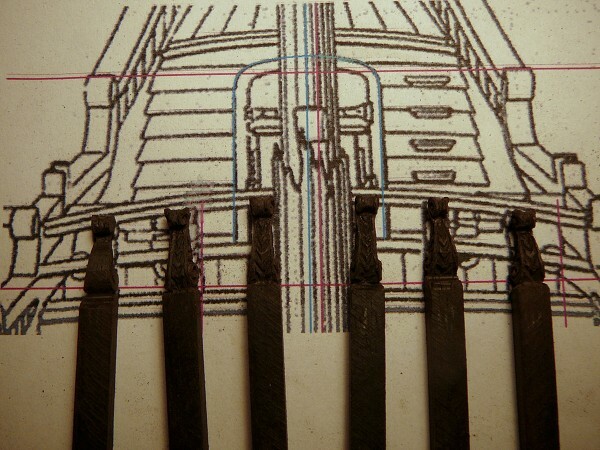 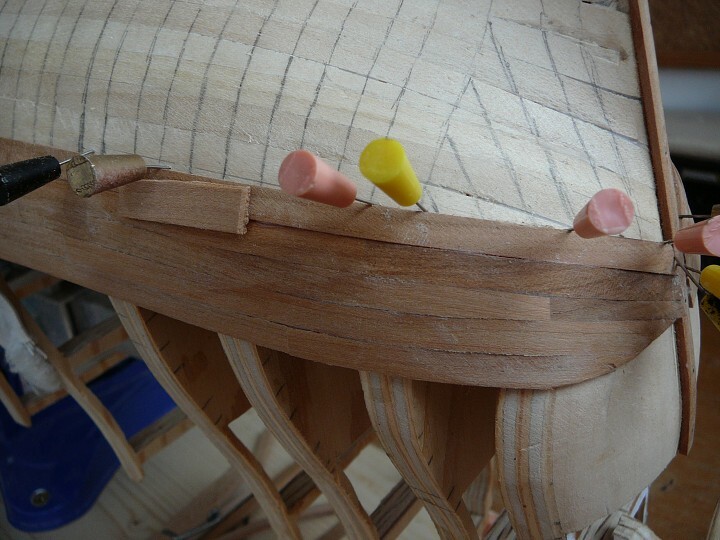 I draw particular timbers including wales for their easier adhesive bonding. 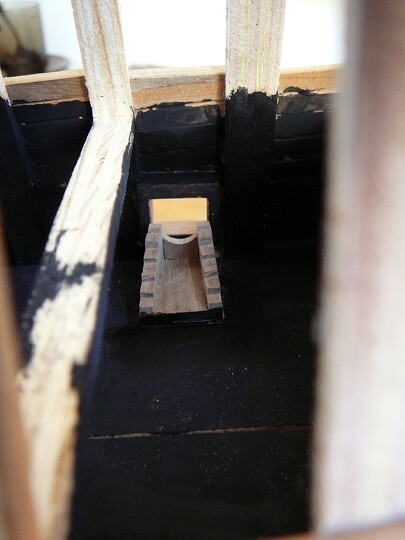 The lower part timbers which were under the first wales I decided to reduce for the first planking. 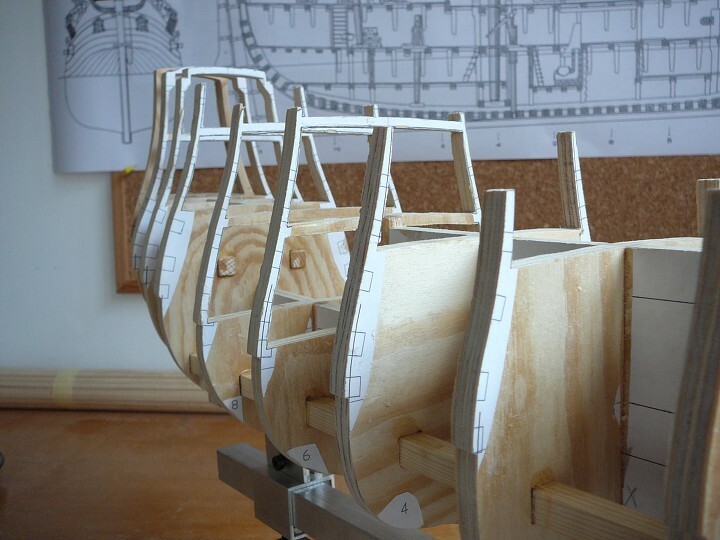 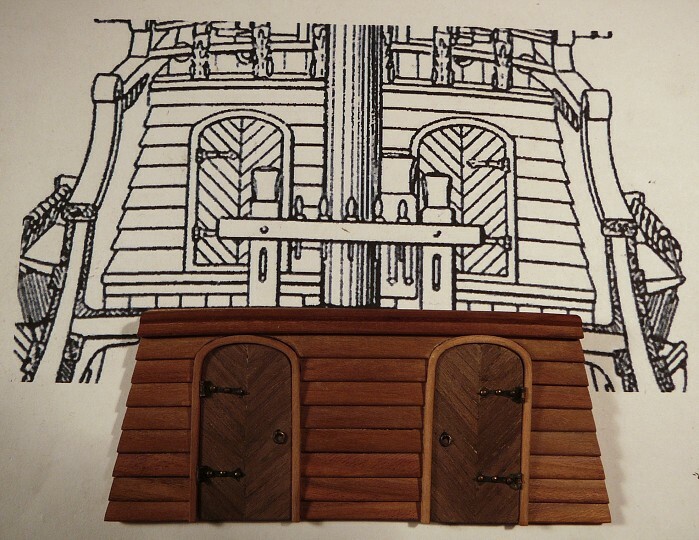 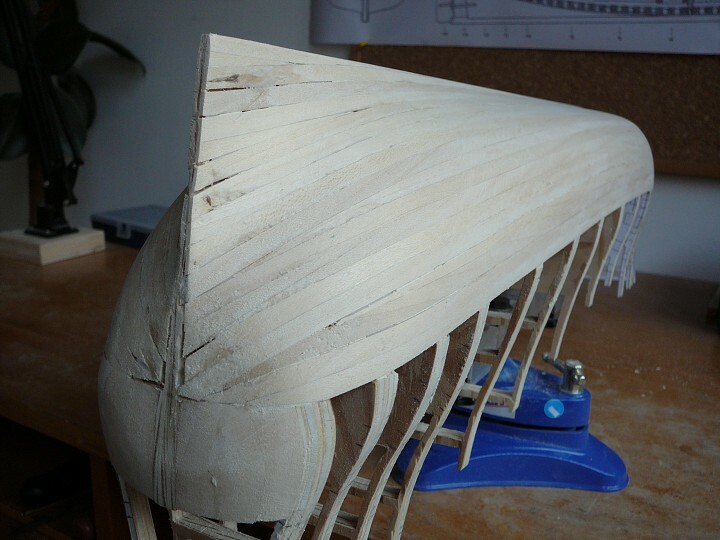 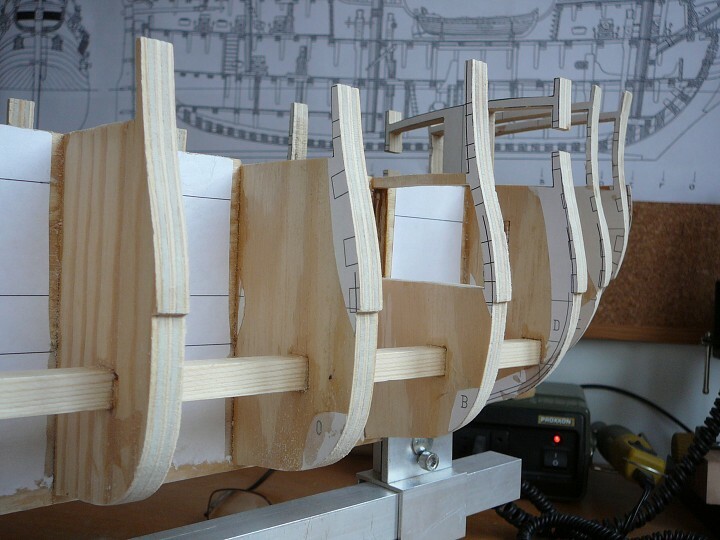 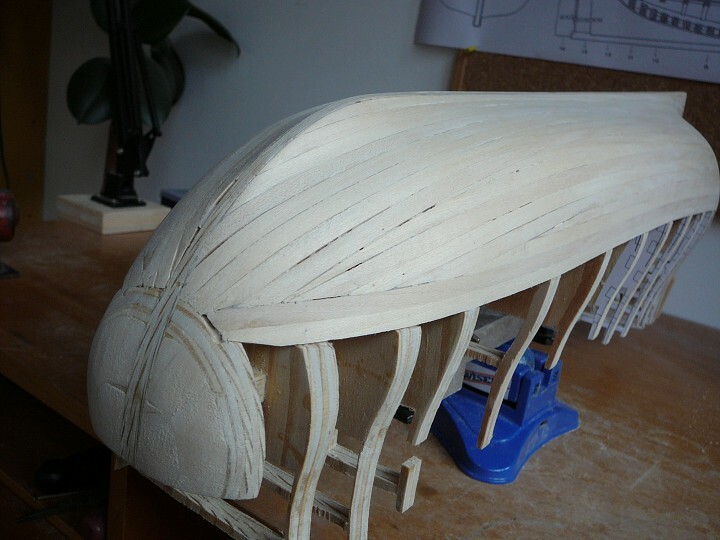 I printed each particular timber and inner keel which is not visible on A4 papers and sticked them on a 8mm plywood. 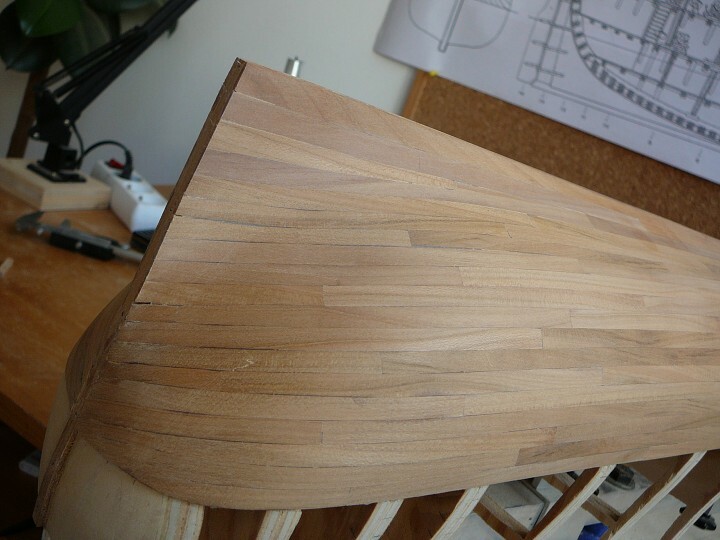 After the finishing of the first planking I cut the material for a second planking. 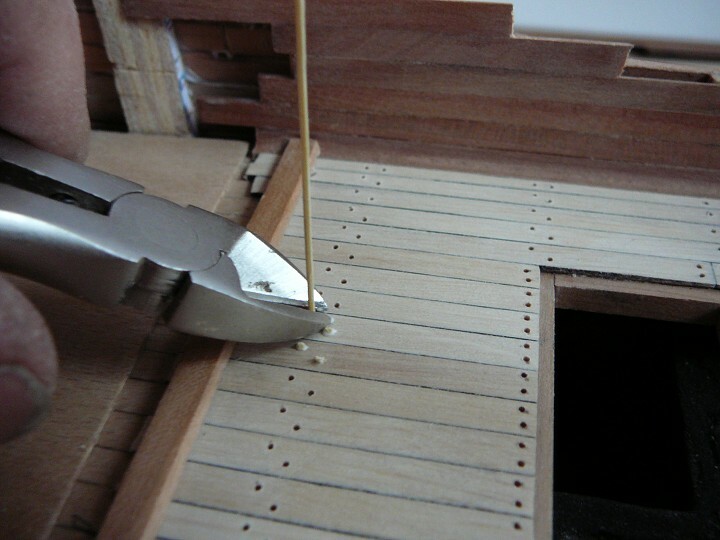 I used a cherry wood and after the cutting the adequate quantity of mouldings I cut individual planks in the length corresponding six metres in reality. 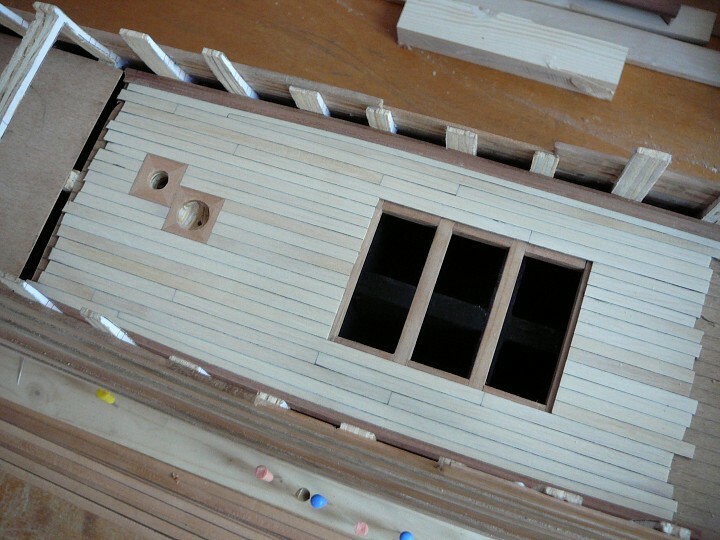 According to the plan I draw all separate frames on the hull and marked a placement of separate planks connections. 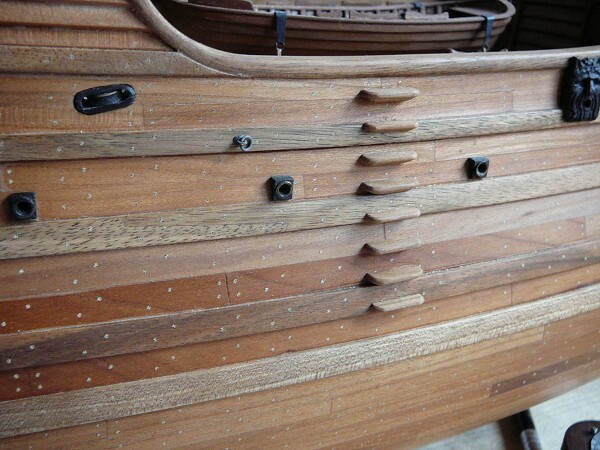 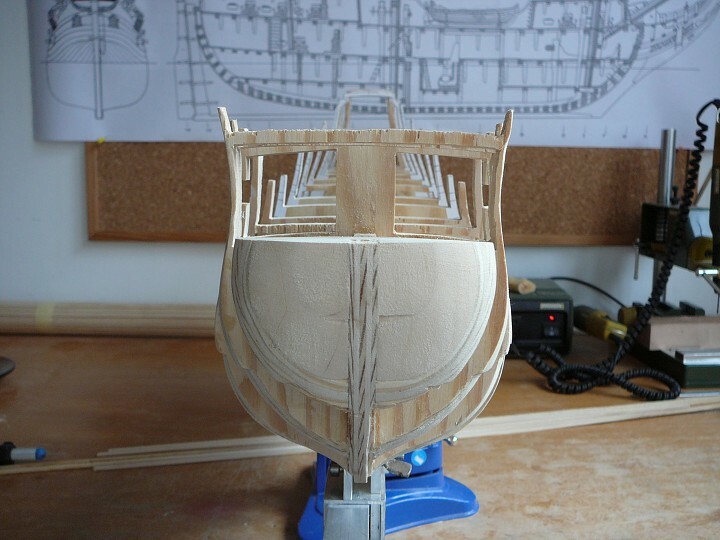 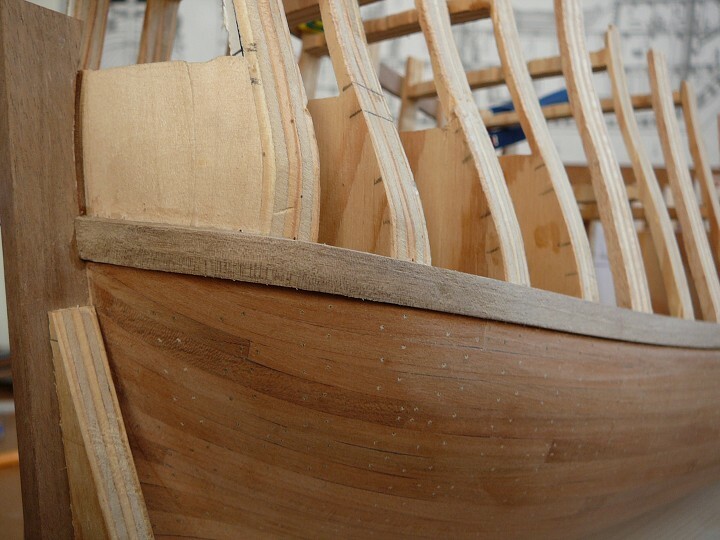 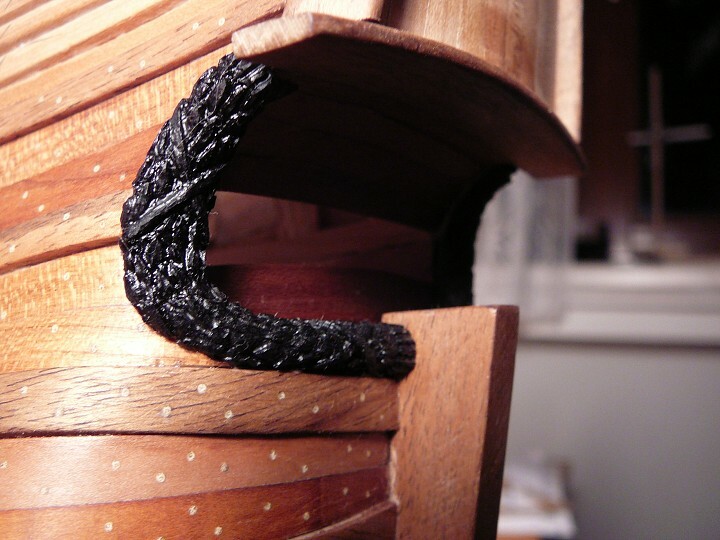 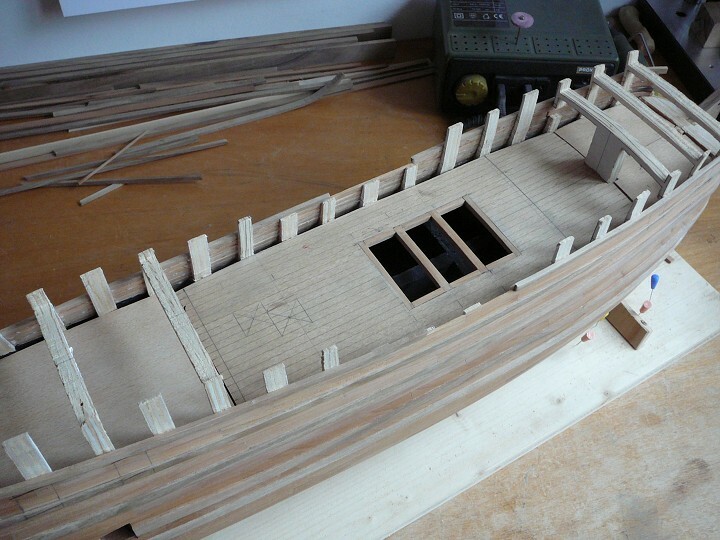 I started the adhesive bonding under the first wales moulding down to keel turning the right and left side. 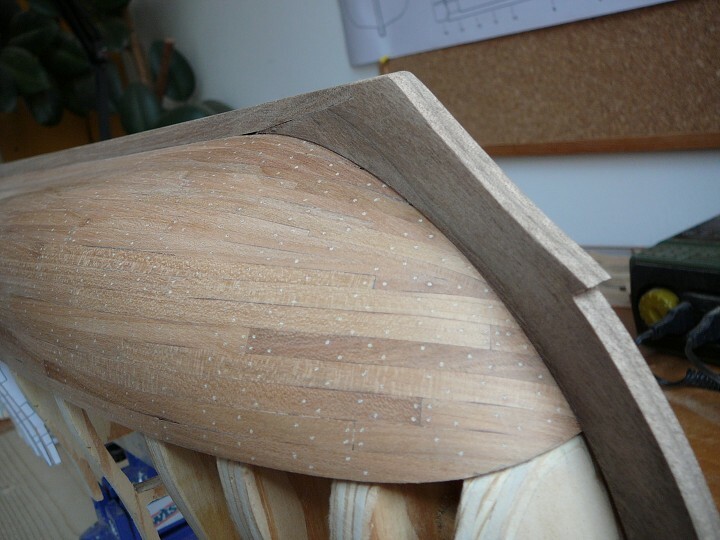 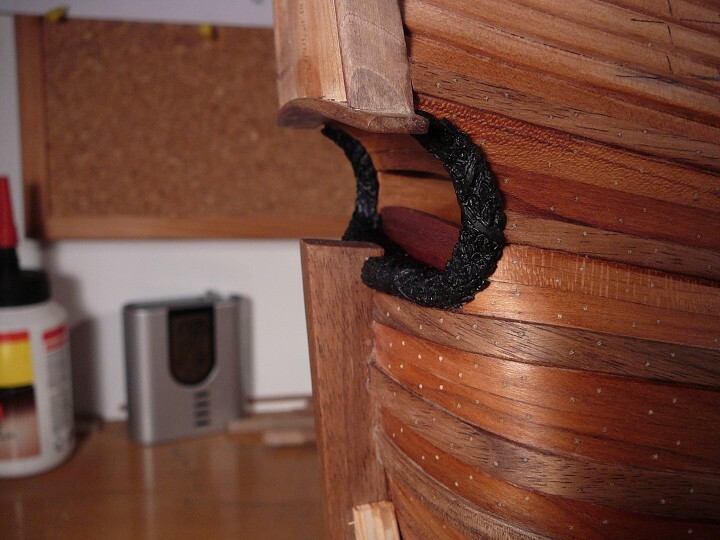 After the gluing of several lines I continued alternatively also from keel. 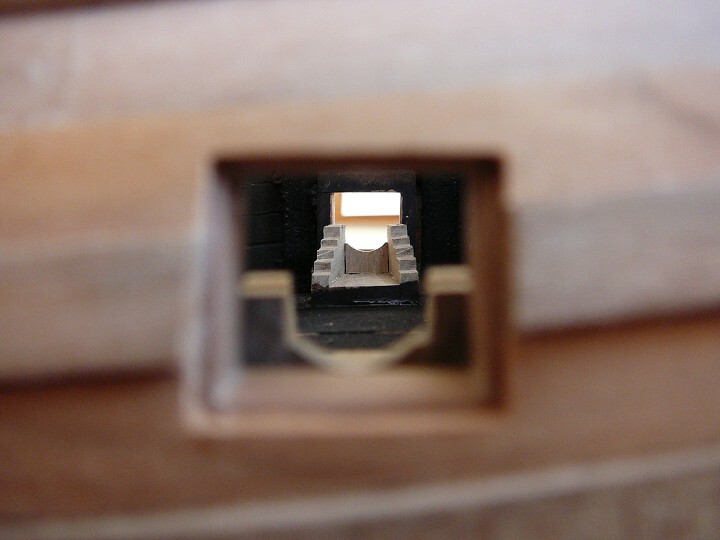 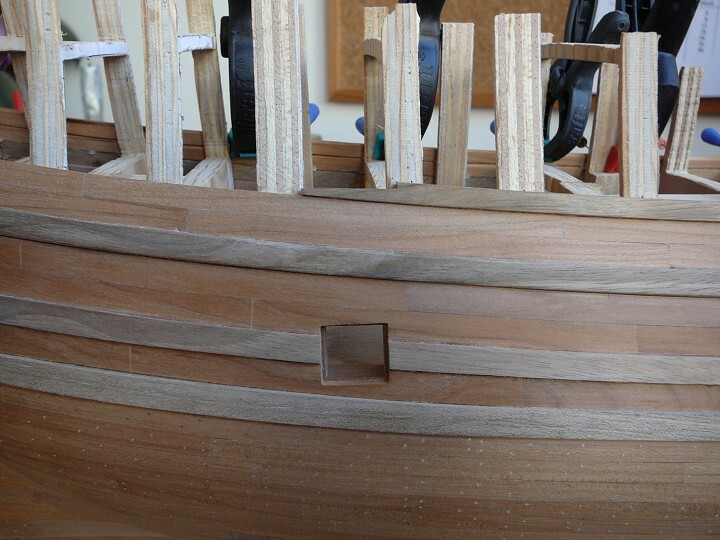 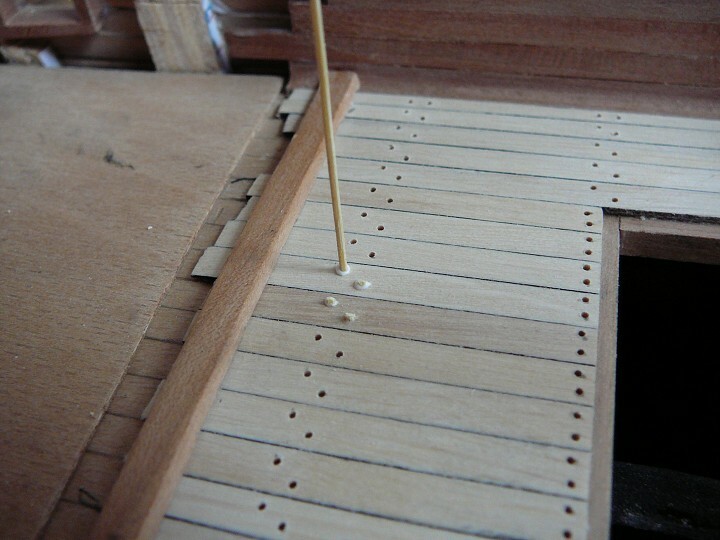 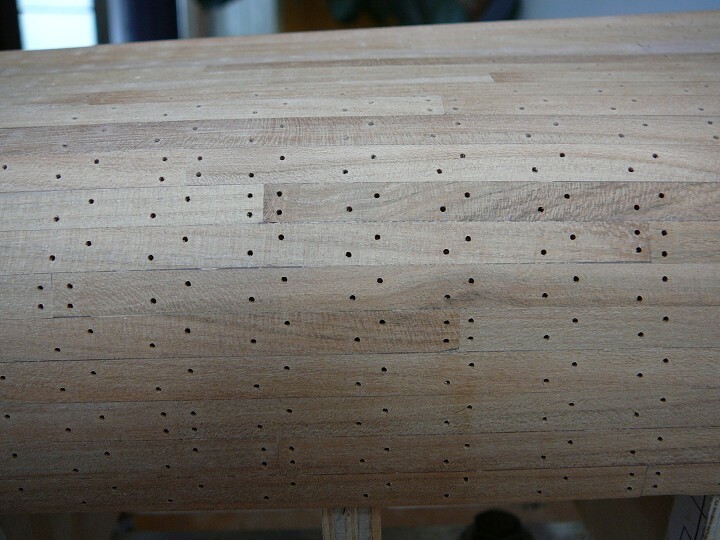 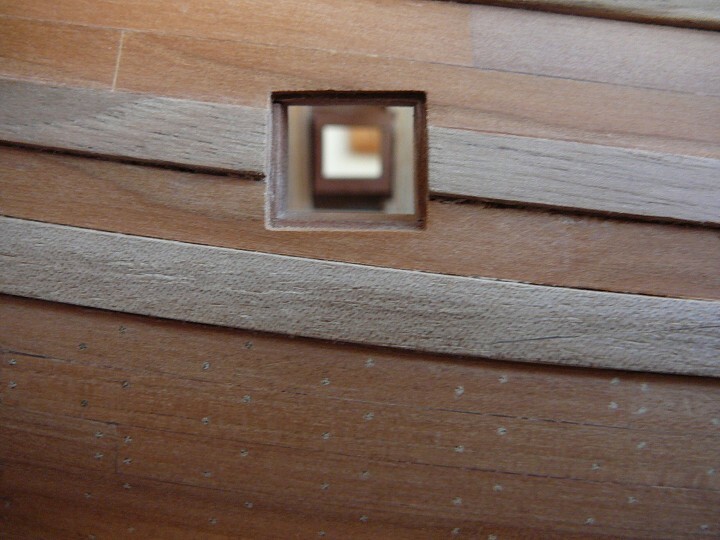 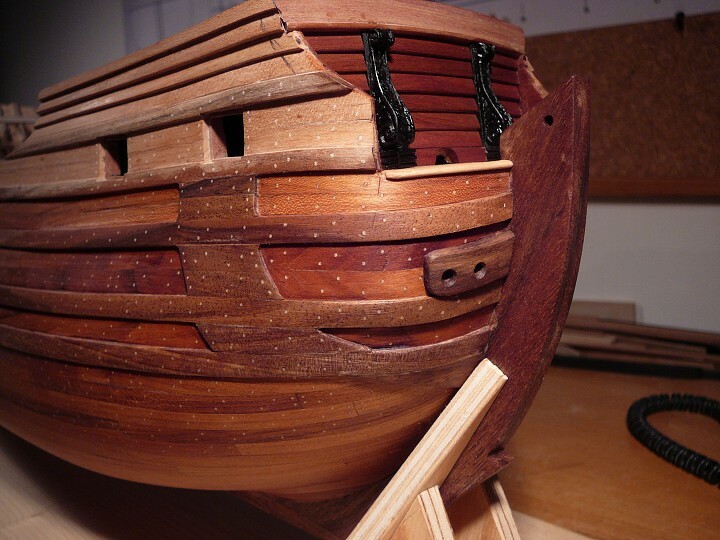 After the gluing of the last plank I grind off a hull on impurity, draw the separate frames with pencil and started to drill the openings for pins that the in reality fixate the planks to frames. 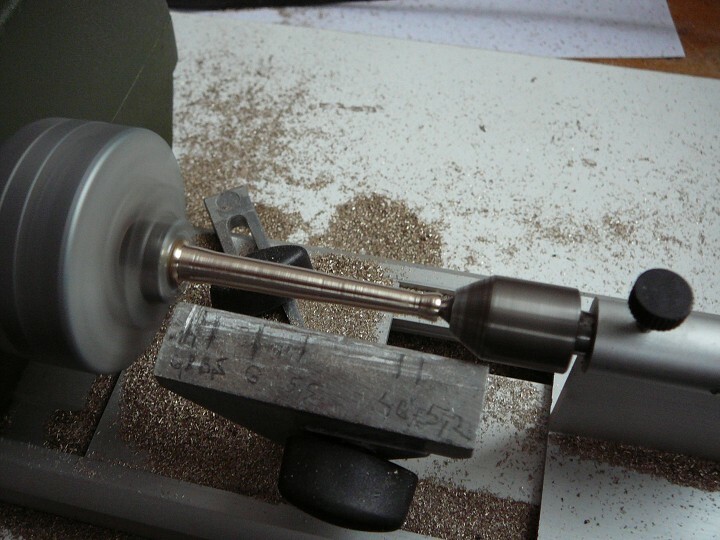 My calibre for drilling was 0,8mm which matches 3,8 cm in reality. 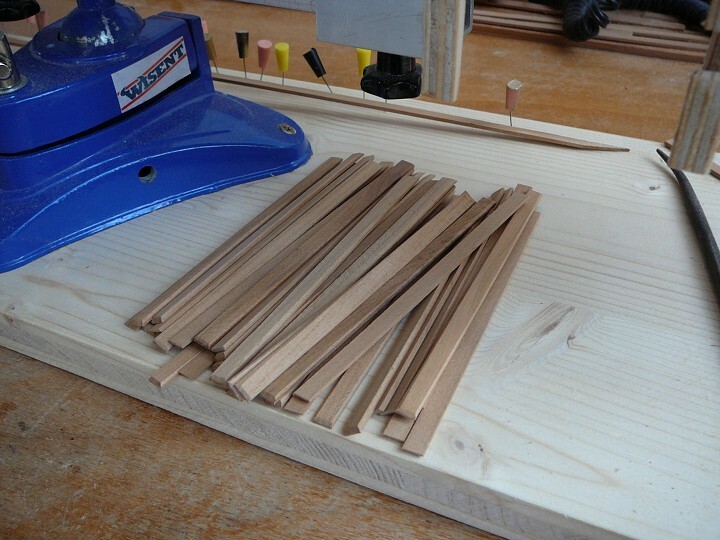 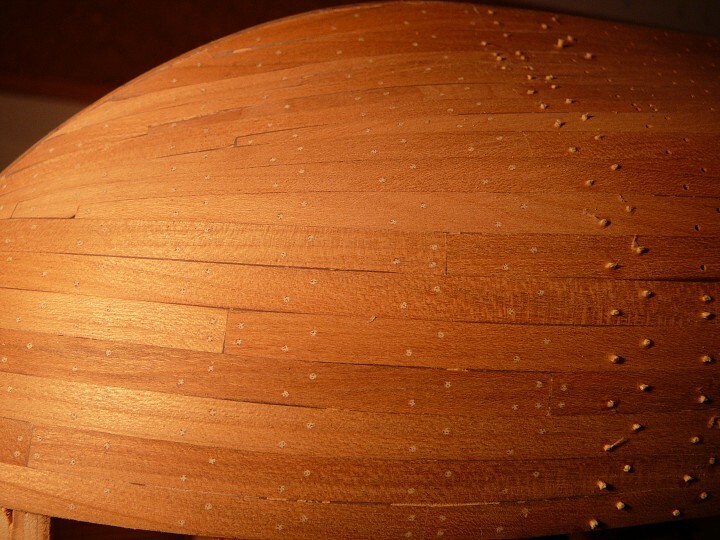 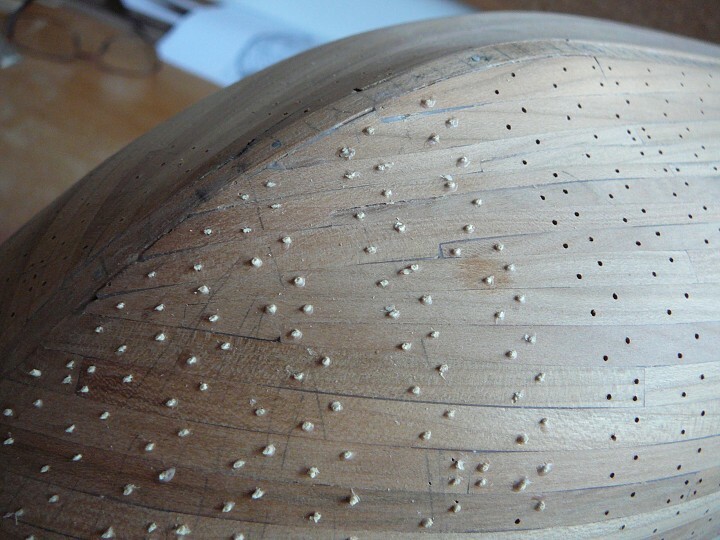 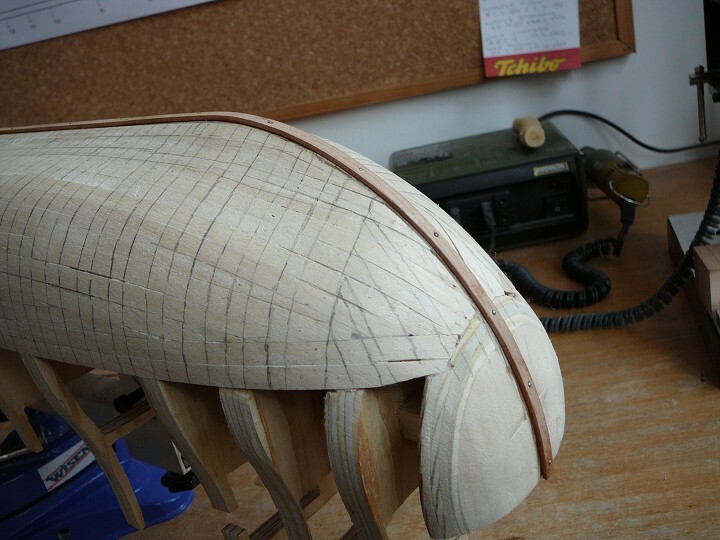 The pins are made of bamboo which is good for cutting, for making such a small calibre and also it´s creating a very good contrast with the cherry planks. 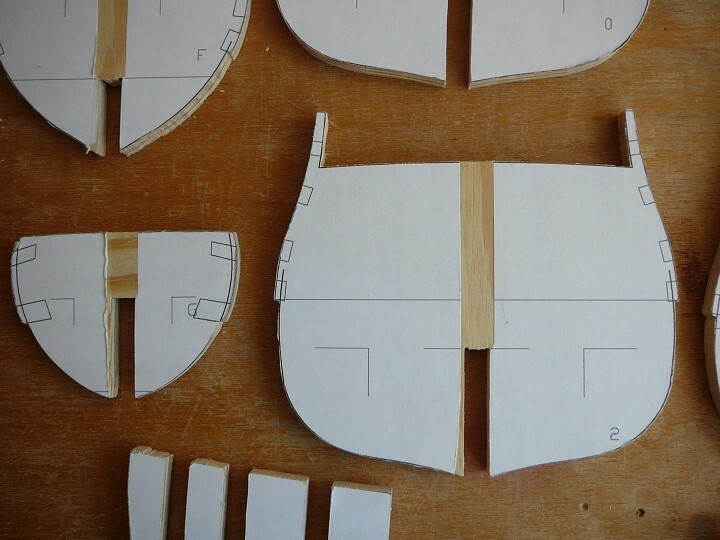 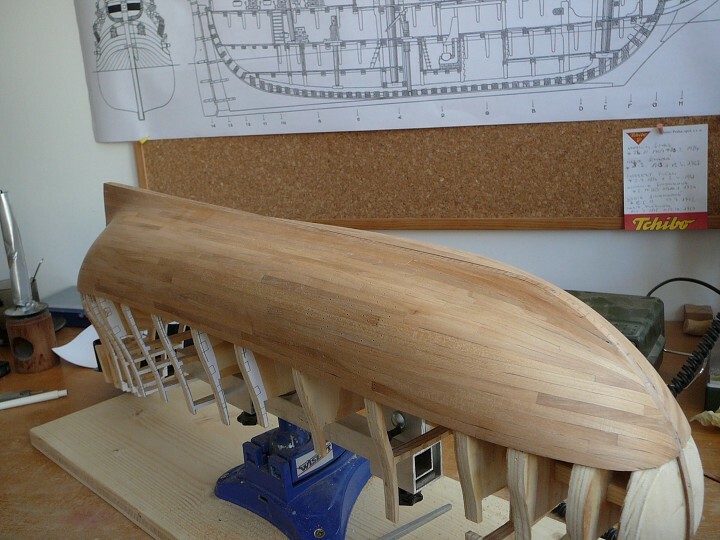 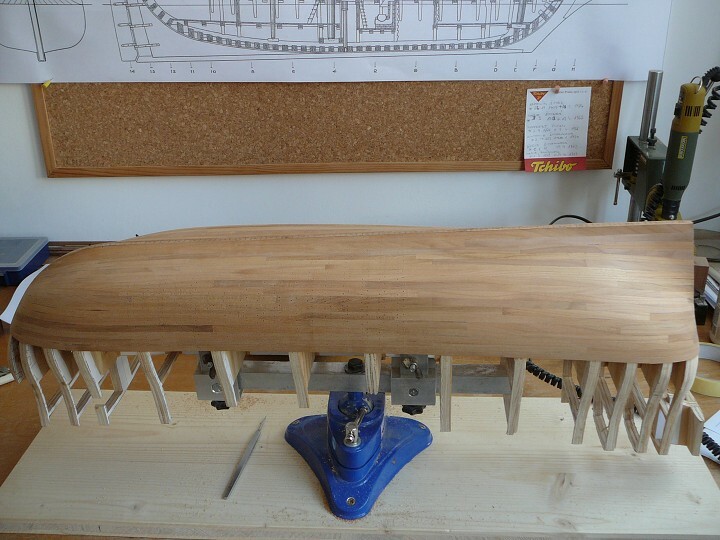 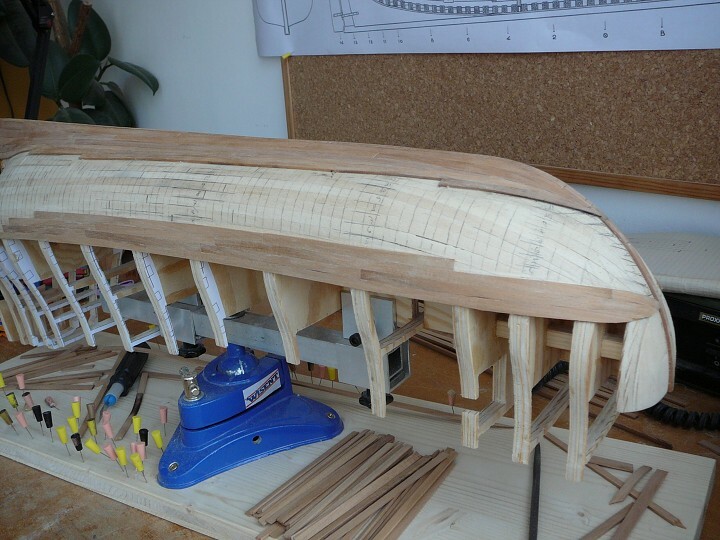 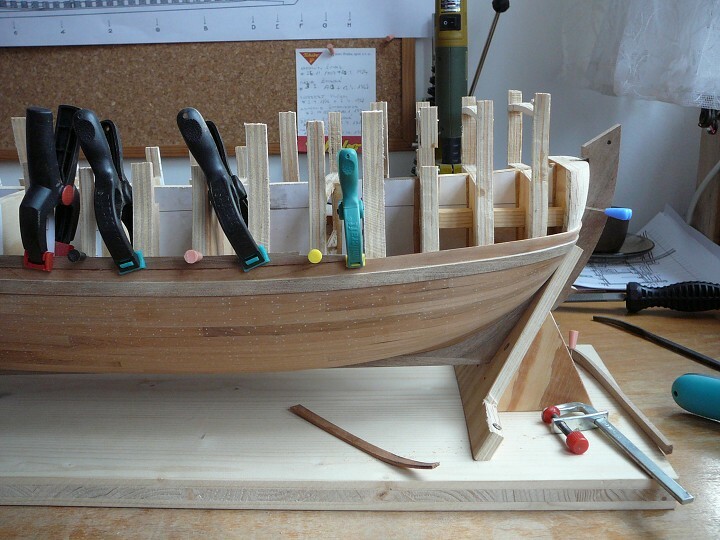 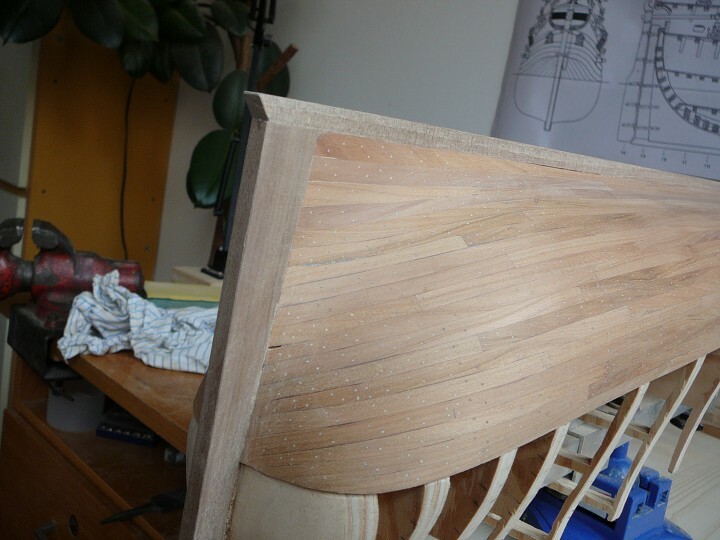 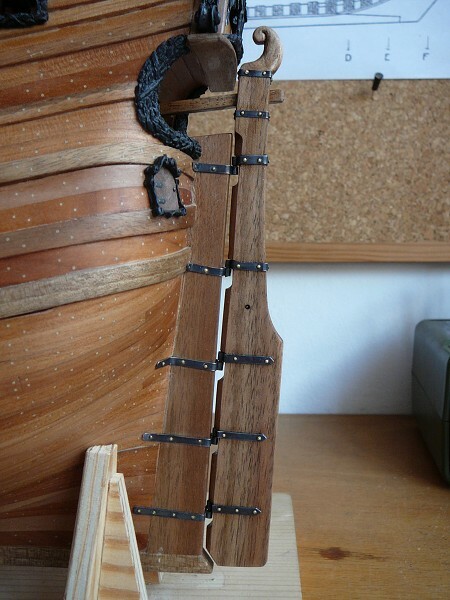 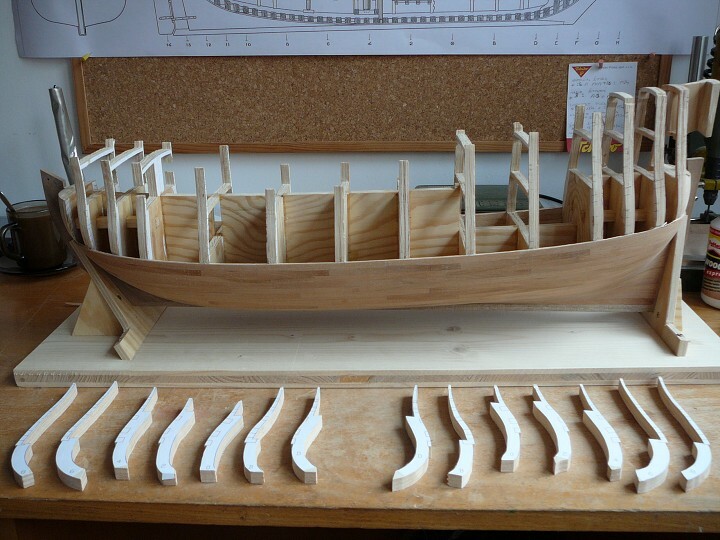 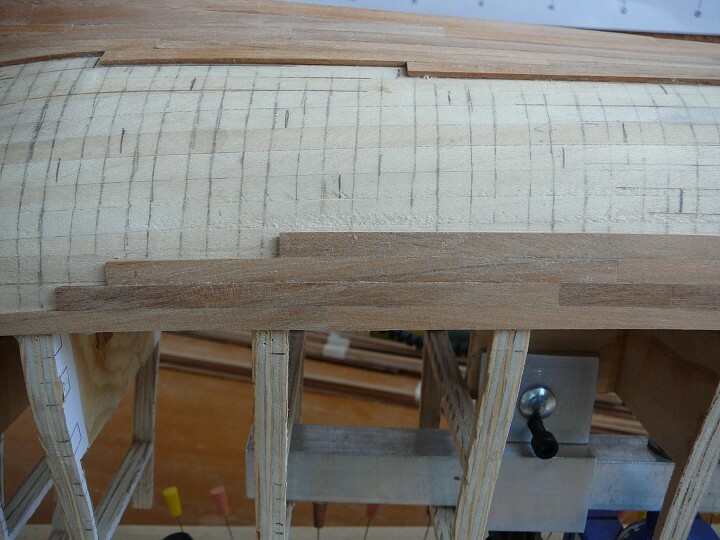 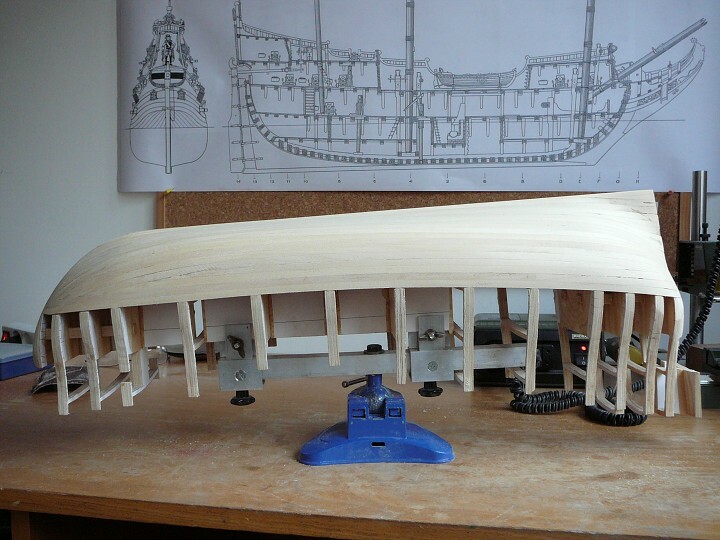 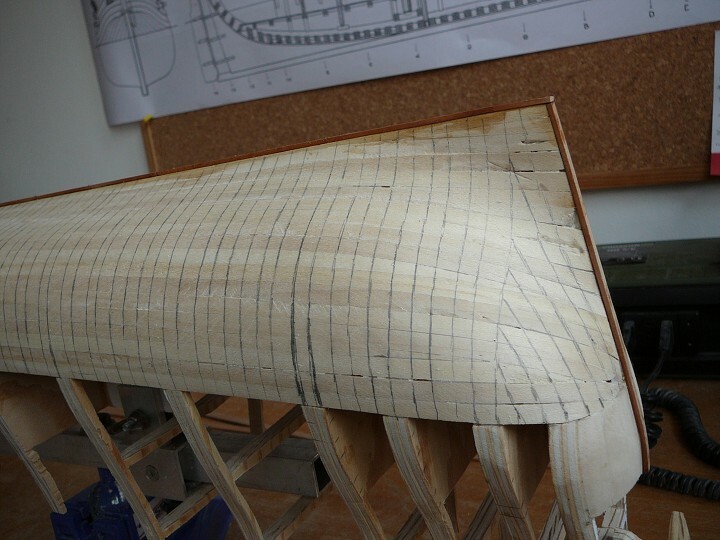 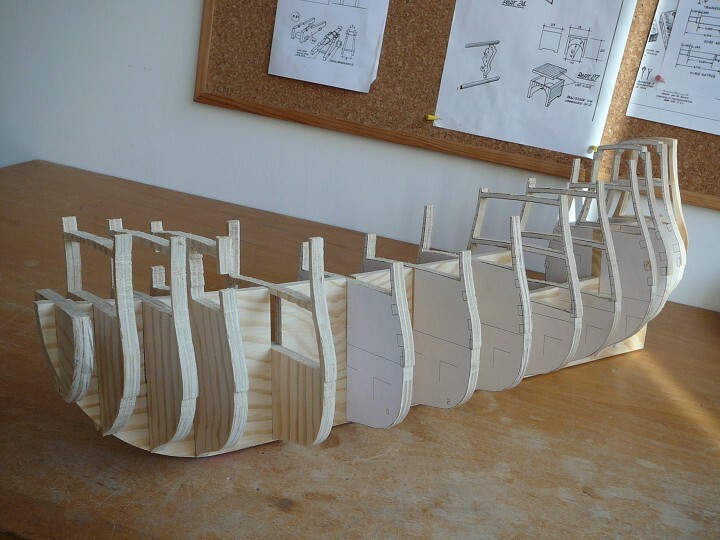 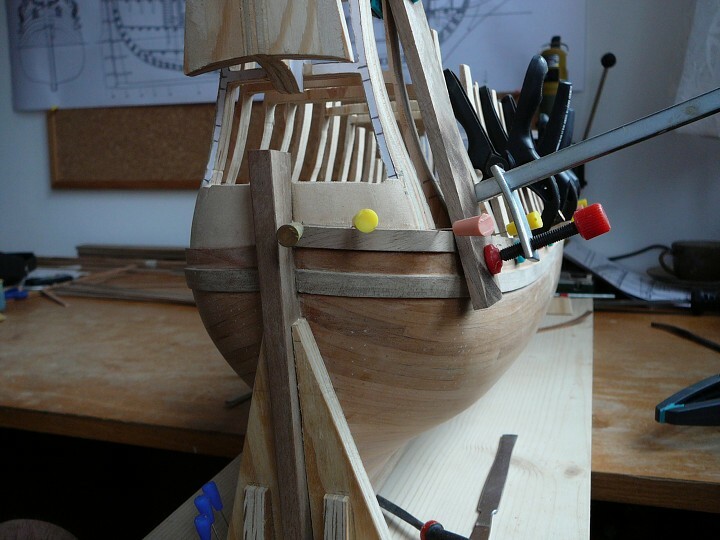 I finished the pinning of the completed planks, cut out visible parts of the keel and fixed it on its place. 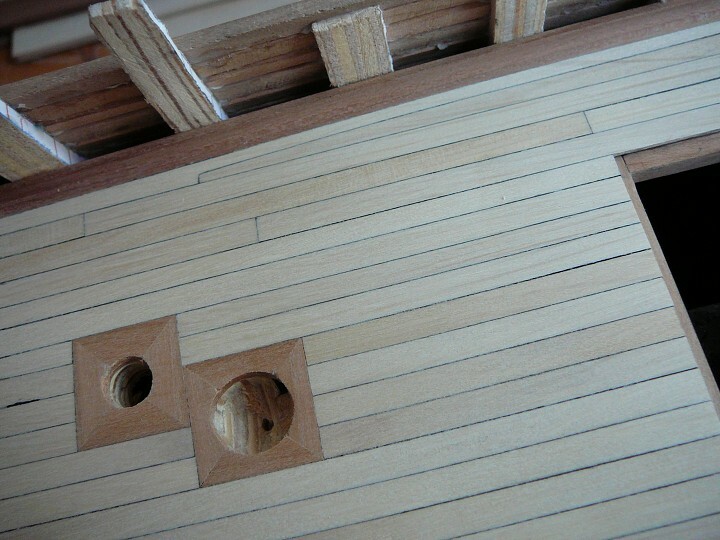 For more easy adhesive bonding of mouldingsand wales and planks between them I implement the bulkheads in framework to the wide spaces. 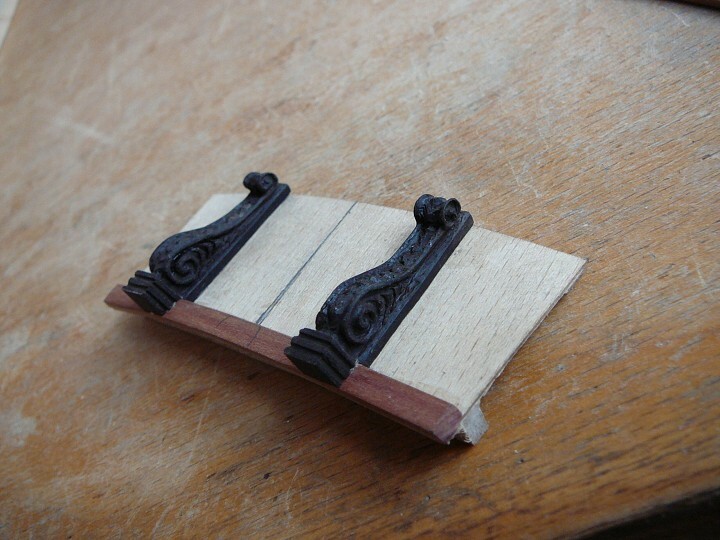 I am doing the wales from a walnut wood which is in contrast with a cherry wood. 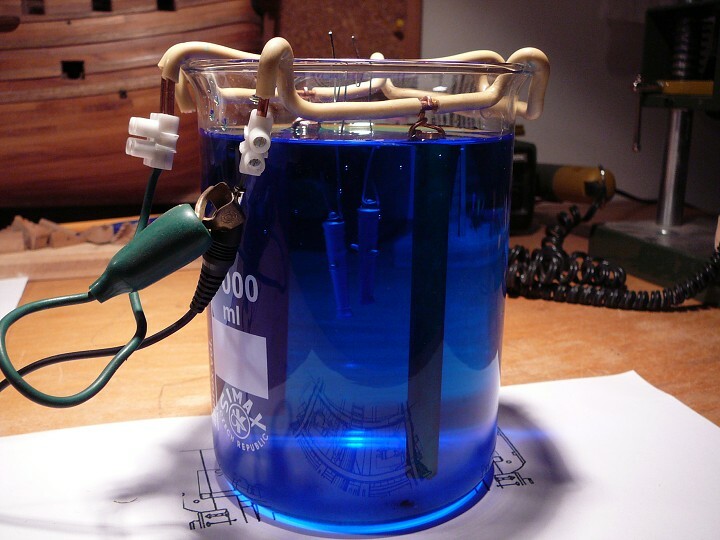 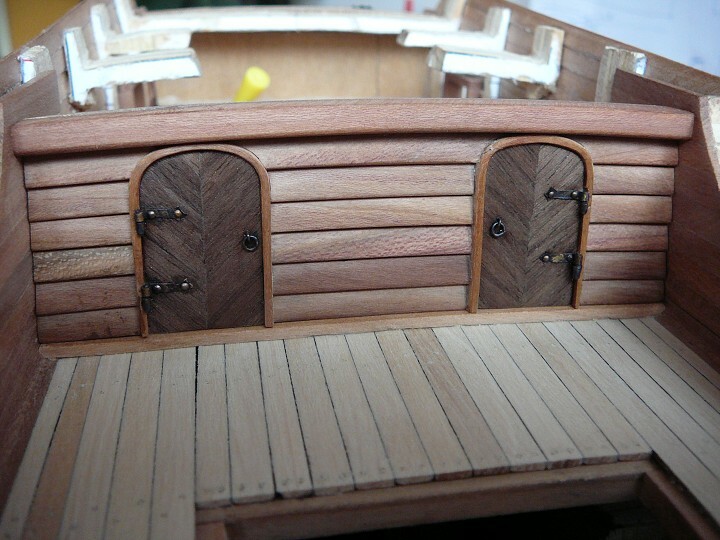 I will be occasionally using the colours as I prefer the natural tone of individual materials. 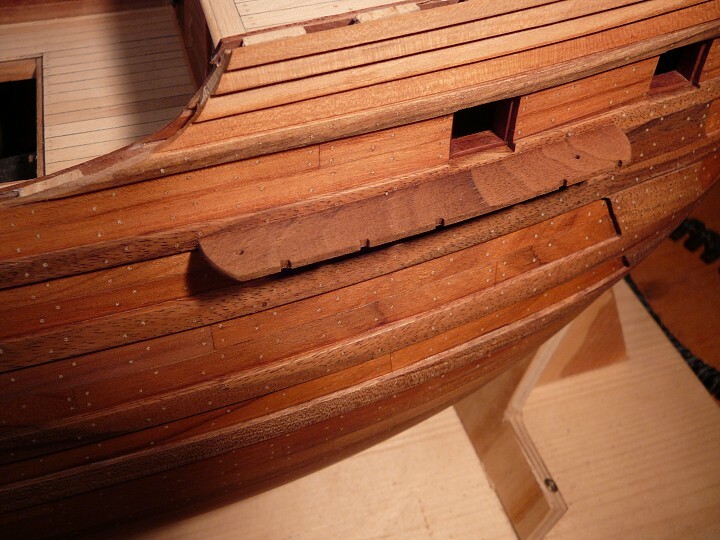 In the final phase I want to paint the hull only with a liquid wax. 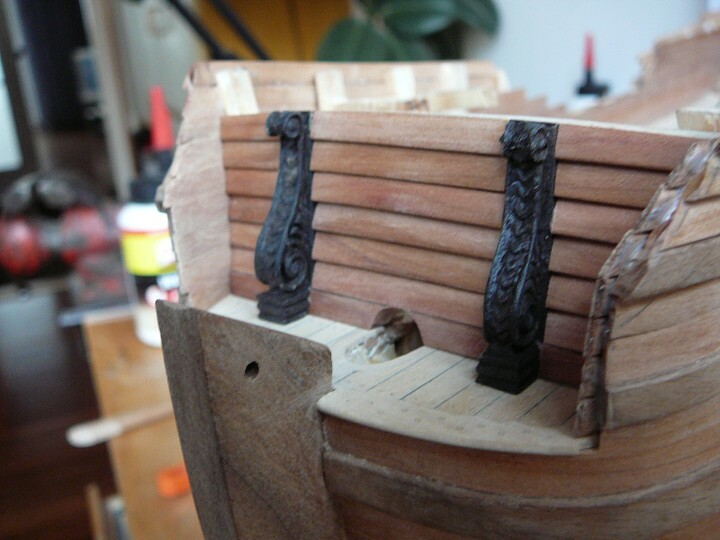 The railing is completed, kevel blocks are installed. 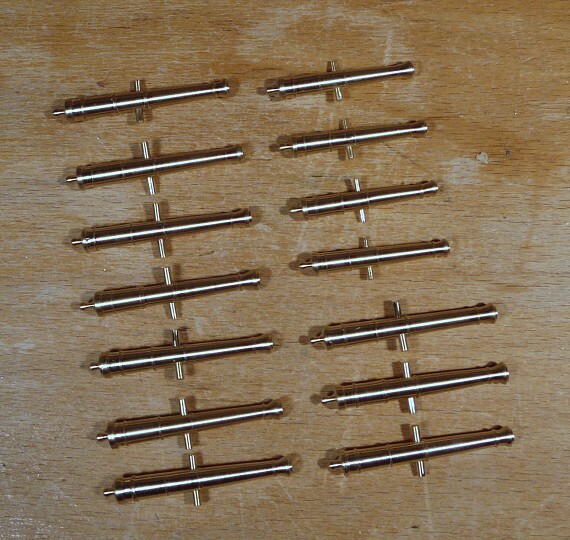 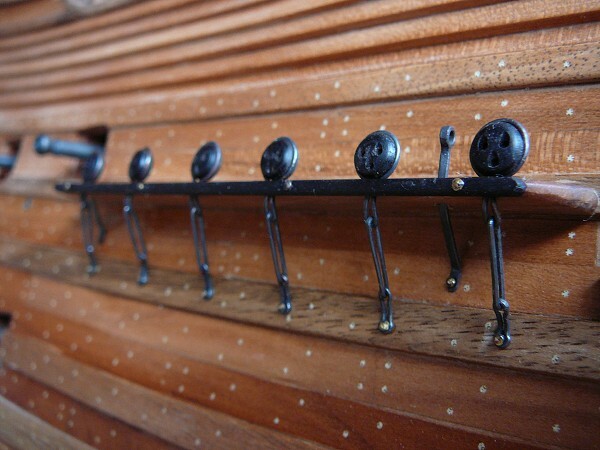 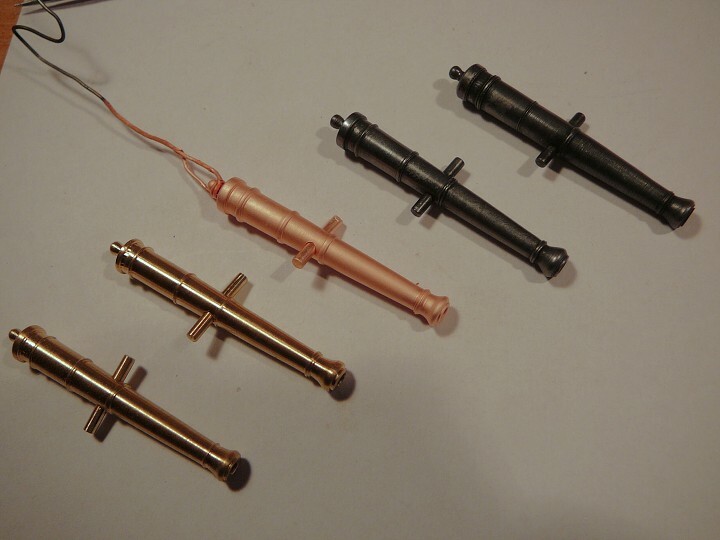 Pin rails, sheet bitts and gratings. 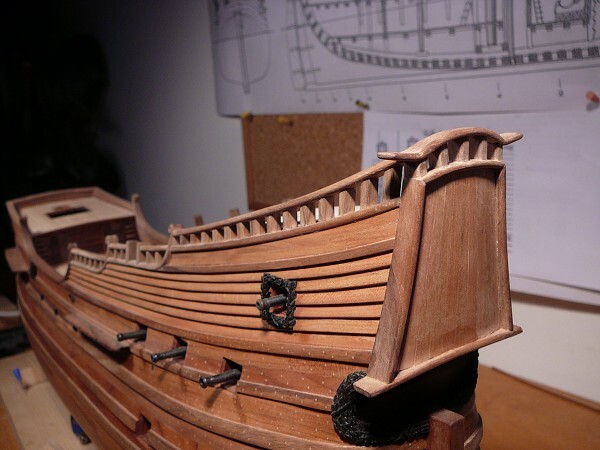 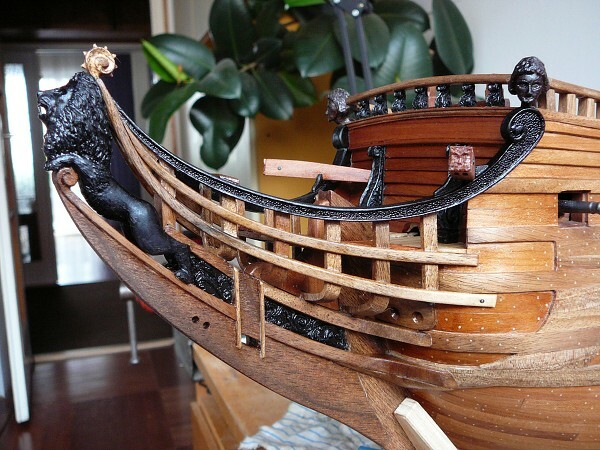 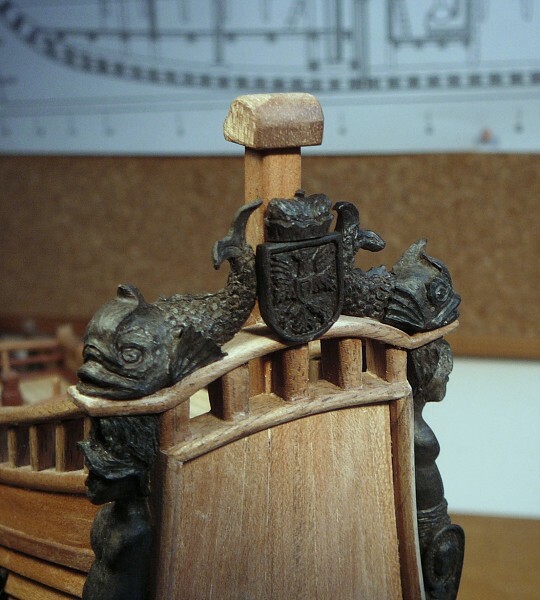 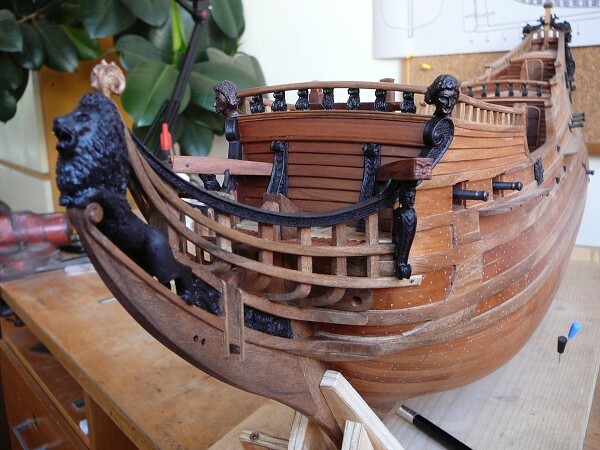 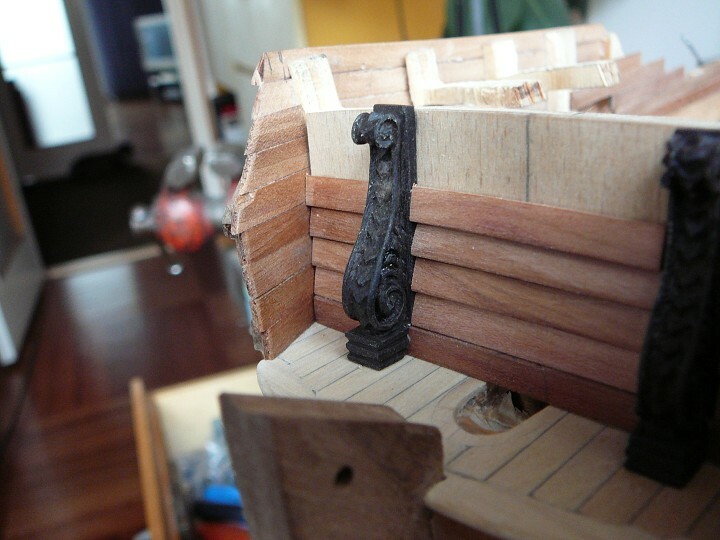 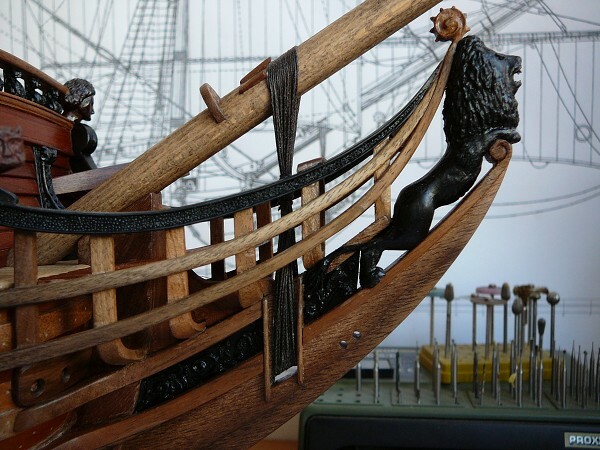 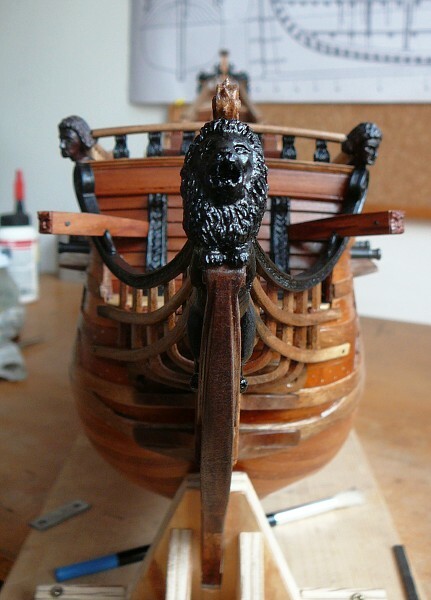 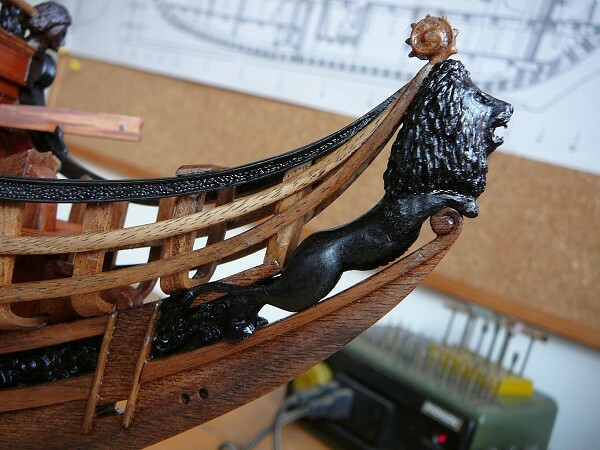 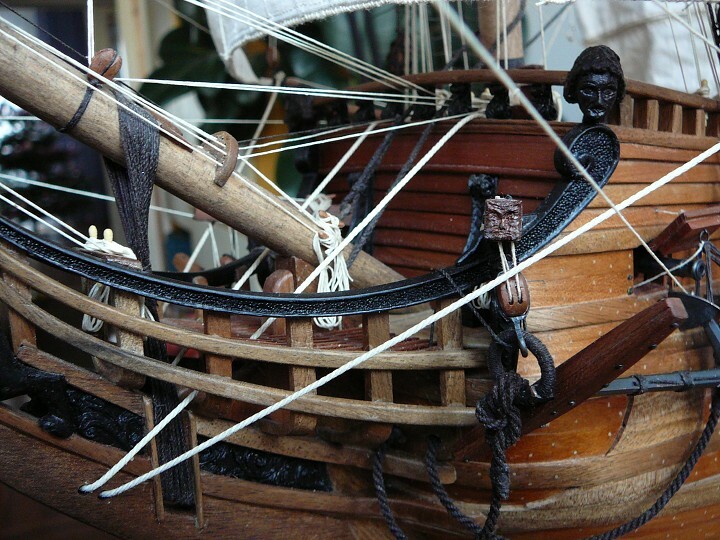 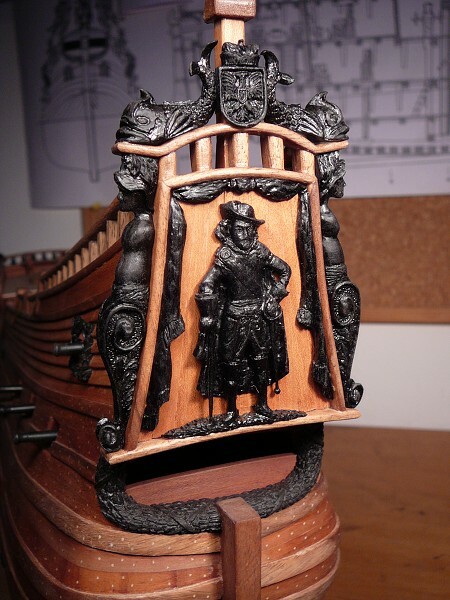 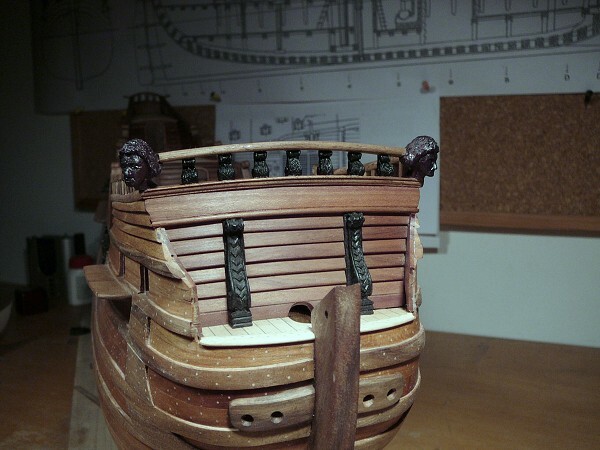 After some time of continuous work - boat and carved figures on stern. 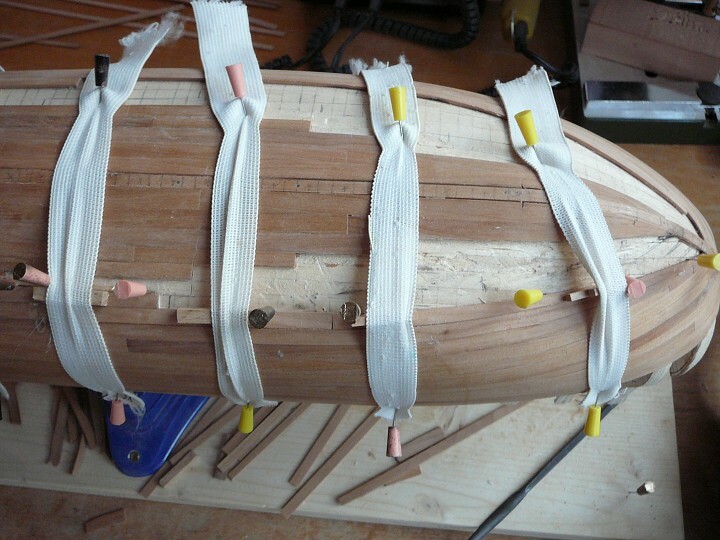 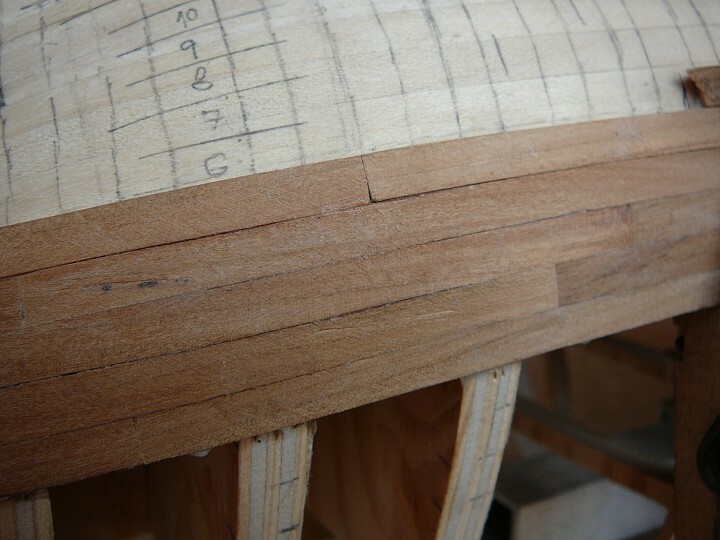 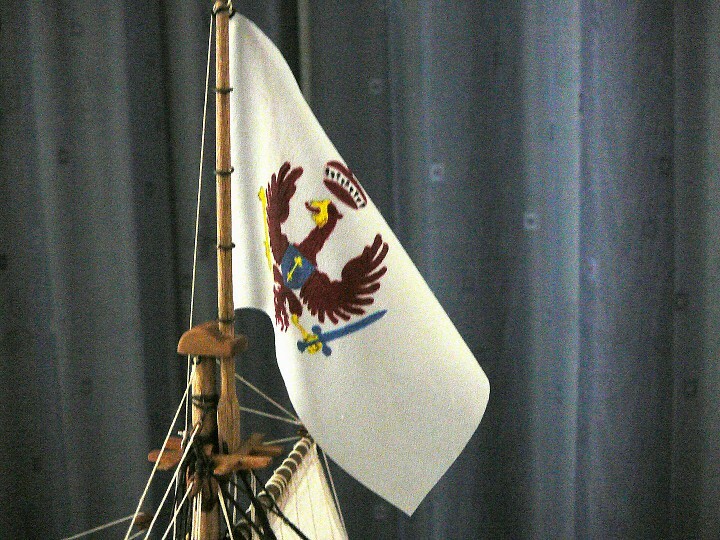 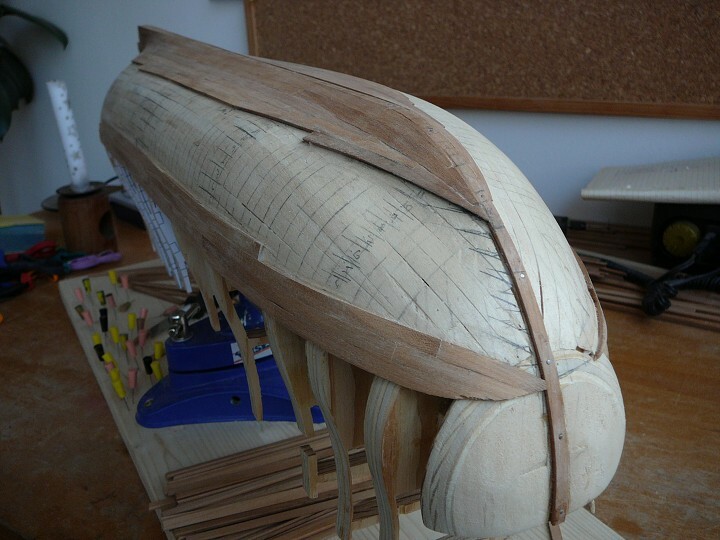 The finalization of a bow, rudder including hitch and DeadEyes. 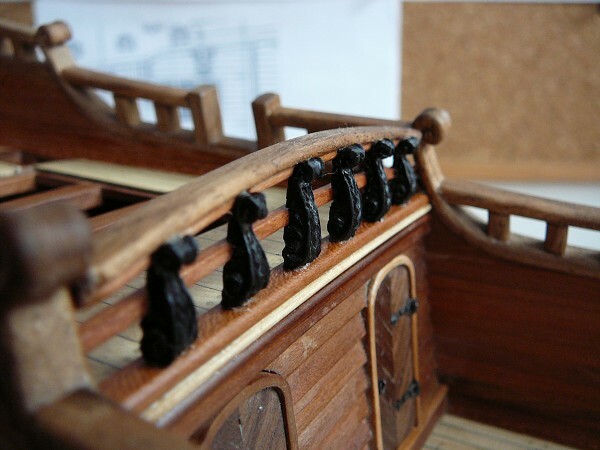 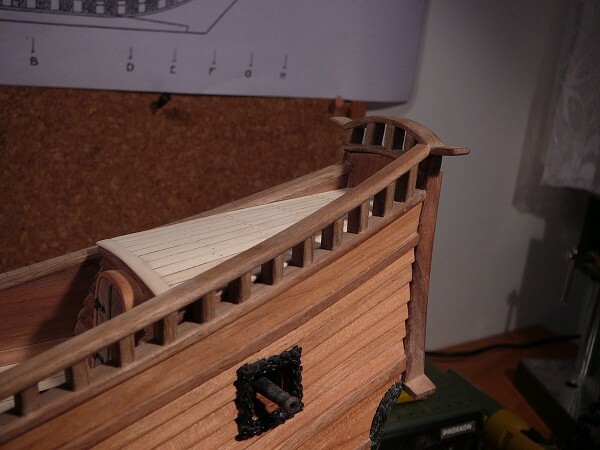 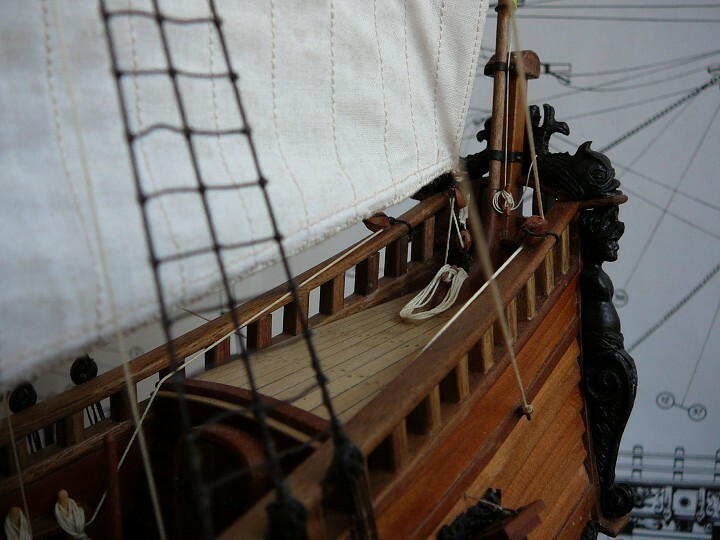 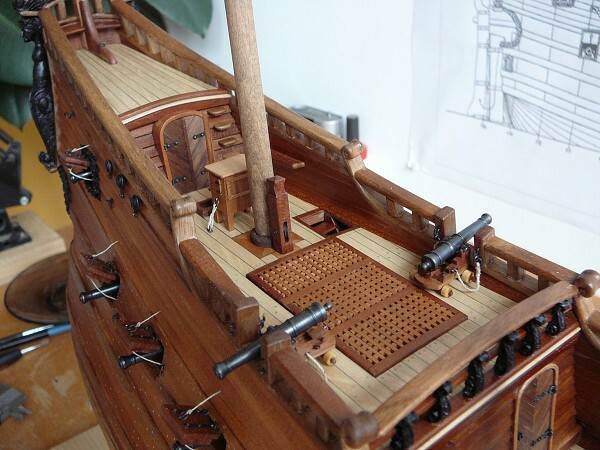 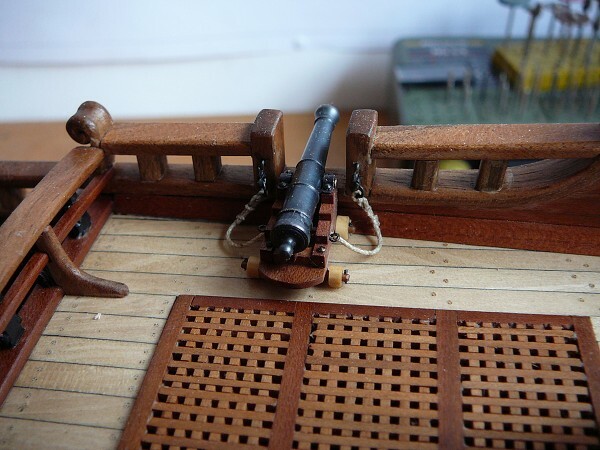 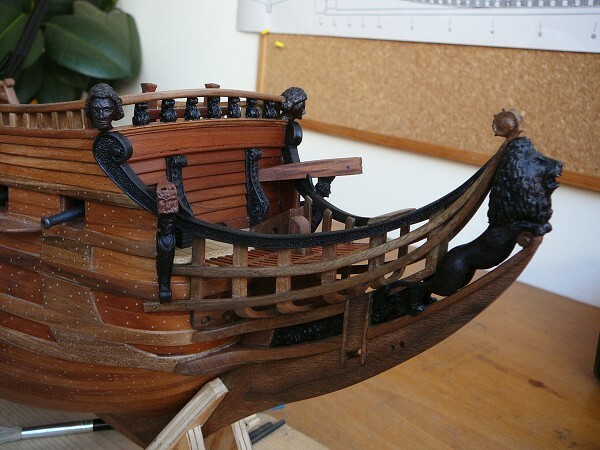 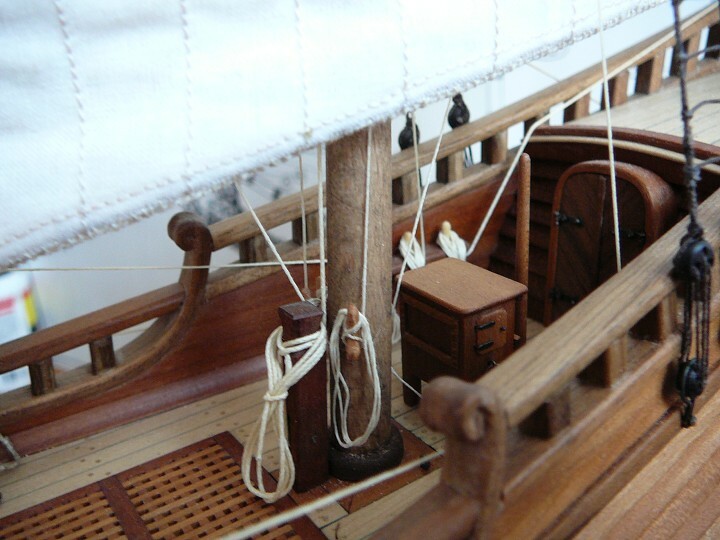 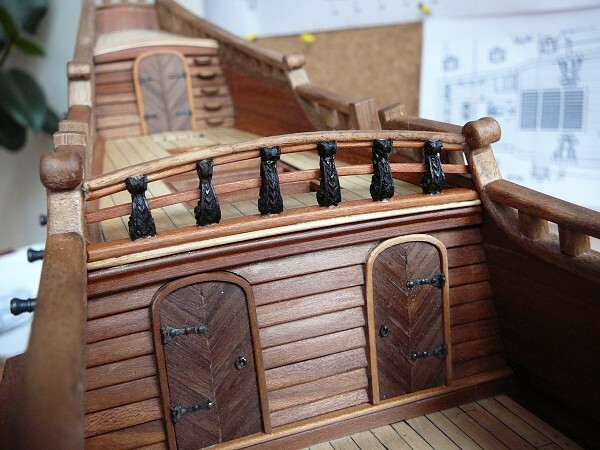 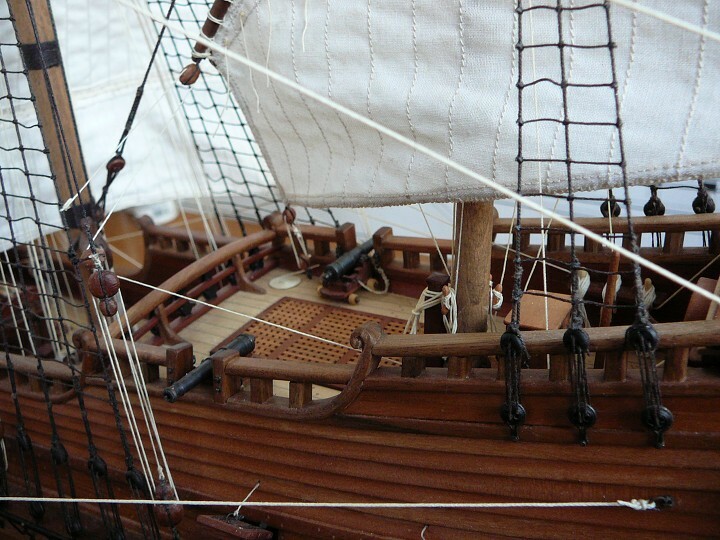 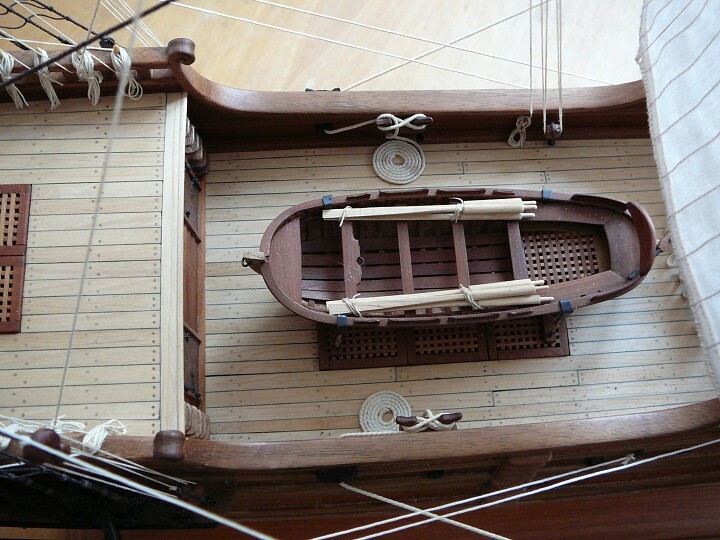 Full finished hull with all details, all parts of masts made, two guns on upper deck, covers gunports, box with compass on a wheelman´s stand plus oars for a boat. 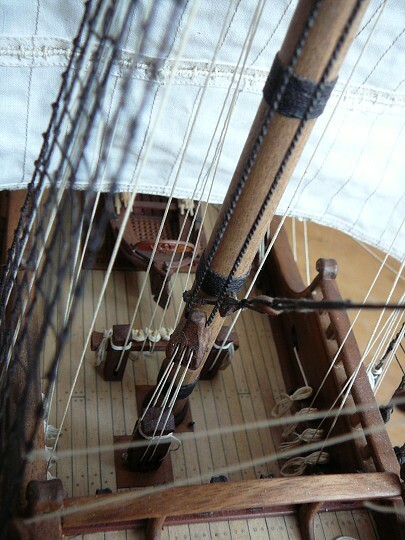 The preparation of ropes will come - scrunching of single calibres according to placement of each rope plus the manufacturing of blocks. 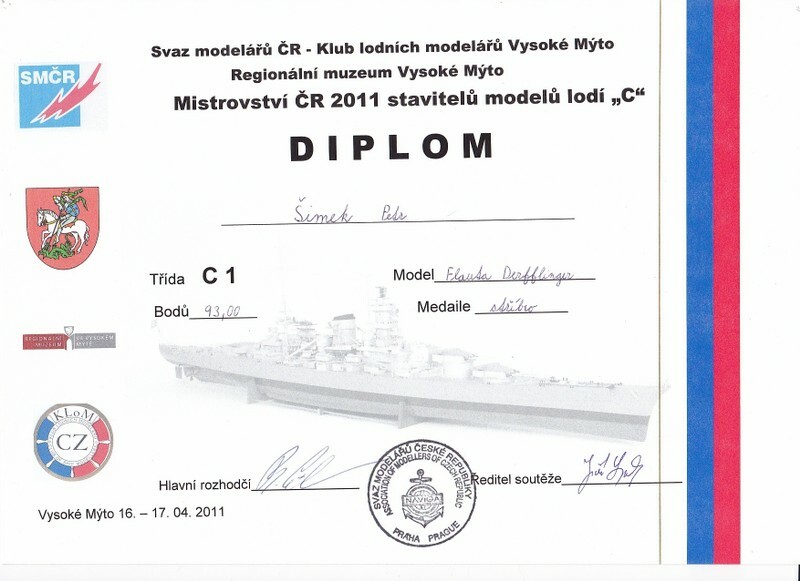 With this model I attended the national championship in Marianske Lázně in 2010, where the Derfflinger won a silver medal. 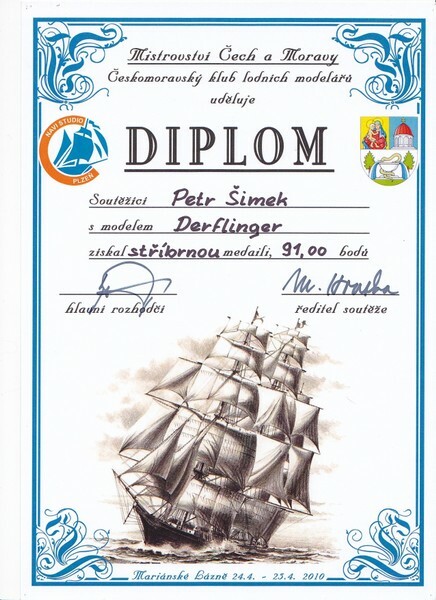 The year after the Derfflinger won again a silver medal on the national championship in Vysoké Mýto. 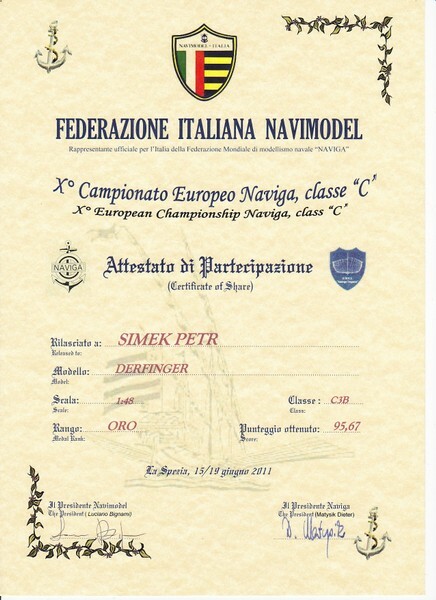 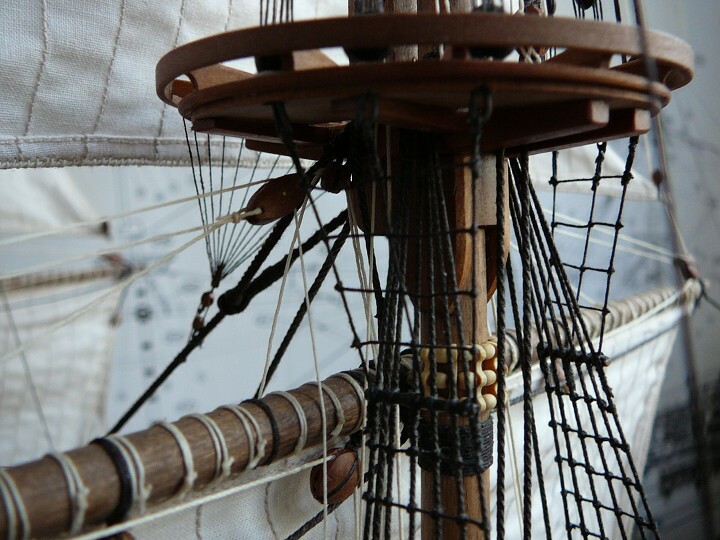 And after the different arrengement like new flags, completion of twists ropes in round tops on masts, mooring parels according to matter and so on (see the photo) was the "Derfflinger" classified in a different category by arbitrators and won a gold medal on Europe championship.